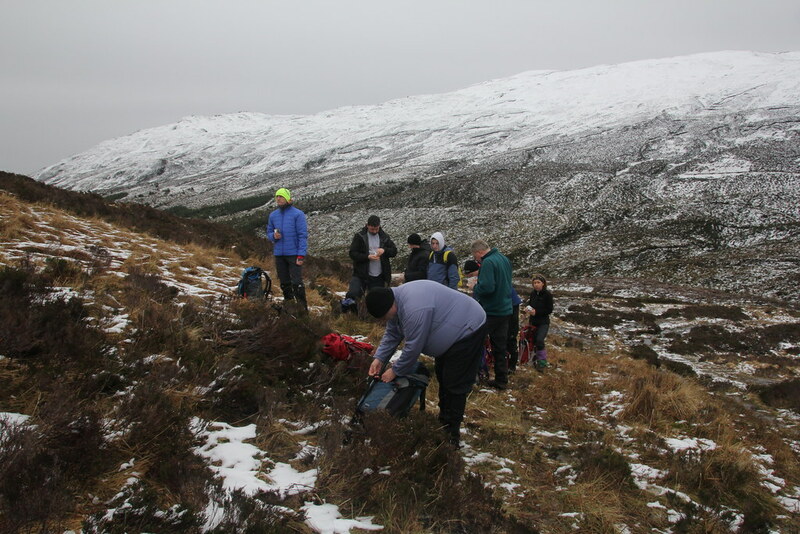 It was that time of year for ageing ex-students from the 80’s to heed the call of the wild and head to the Southern Highlands. 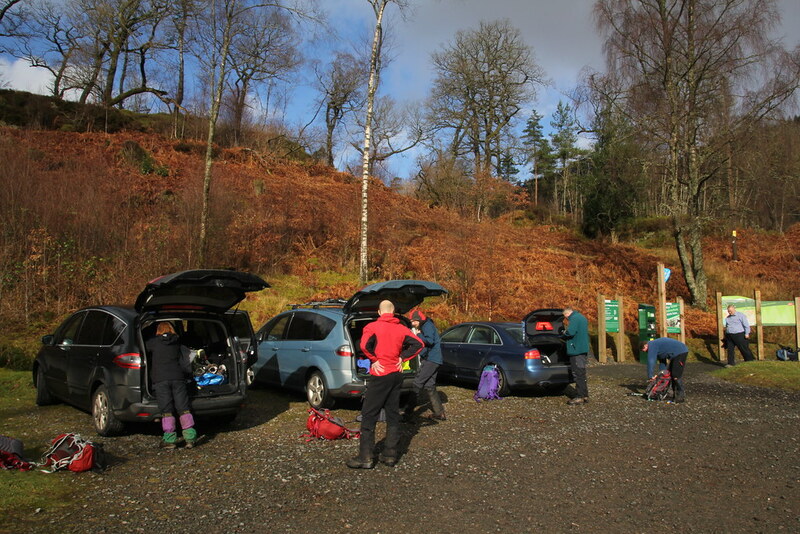 It’s been a tradition for nearly 10 years to get together in early March and the weekend seems to go from strength to strength. 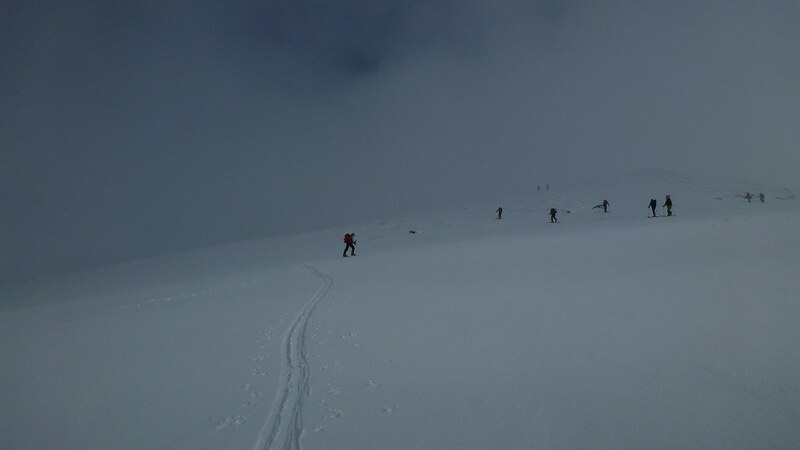 This year TBF joined the gang and the both of us collected GM to head up on the Thursday to make a longer weekend of it. 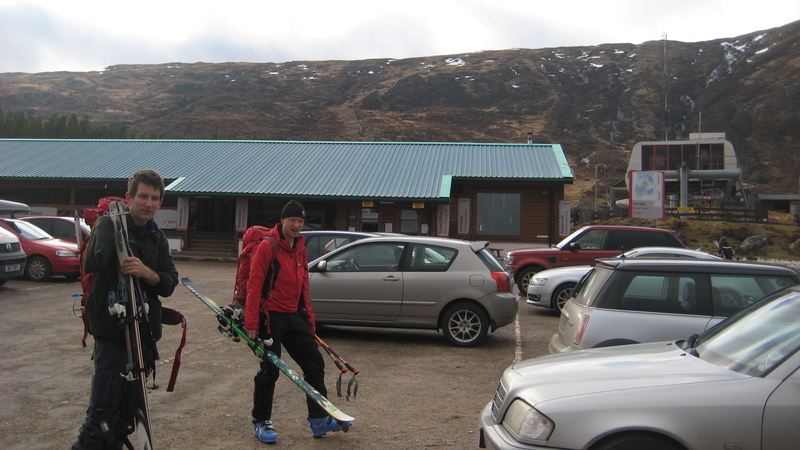 Our home of the past few years, The Suie Lodge Hotel, welcomed us late and looked after us with their usual relaxed hospitality. 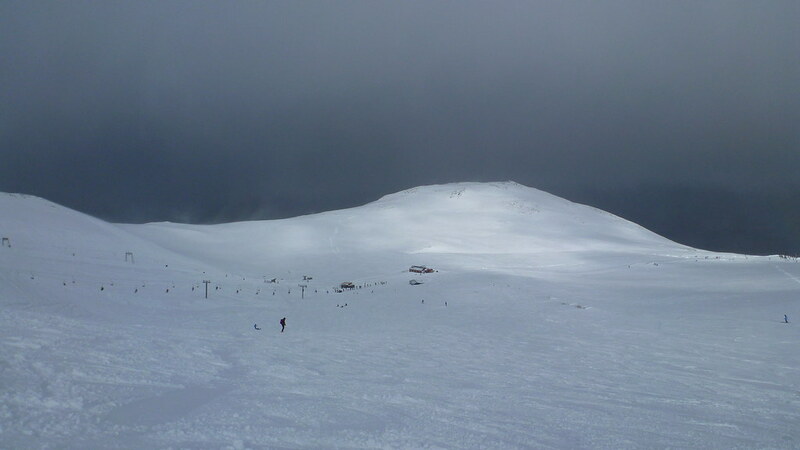 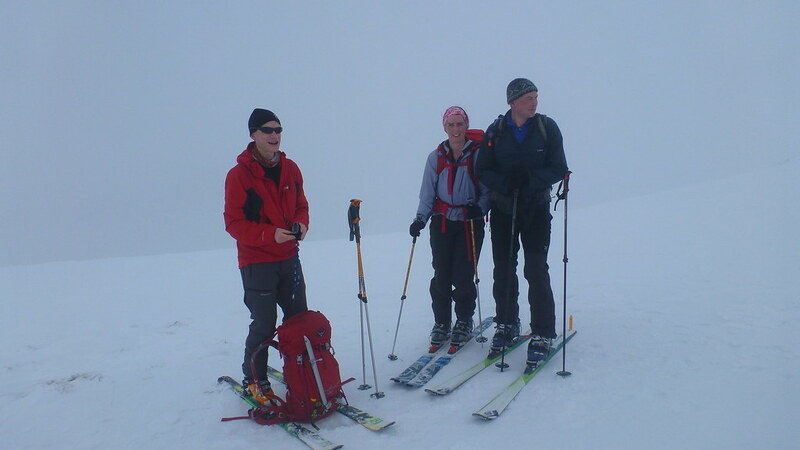 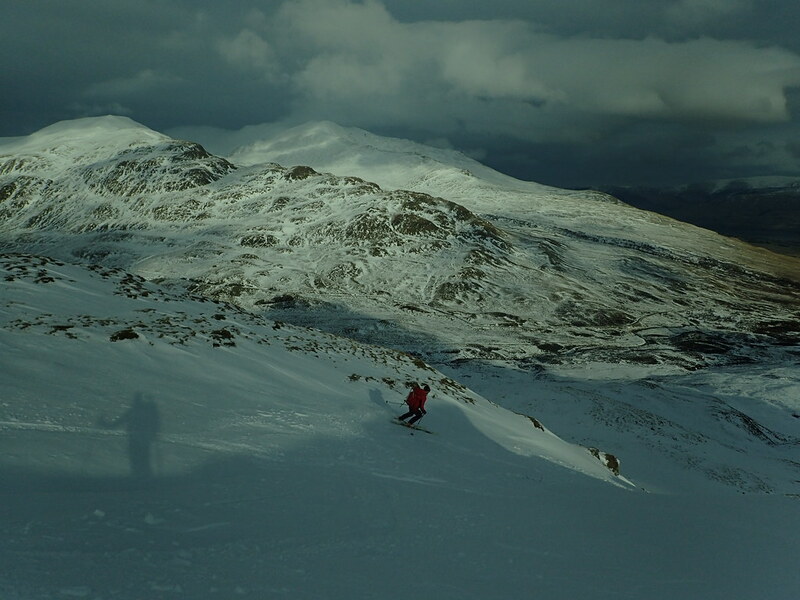 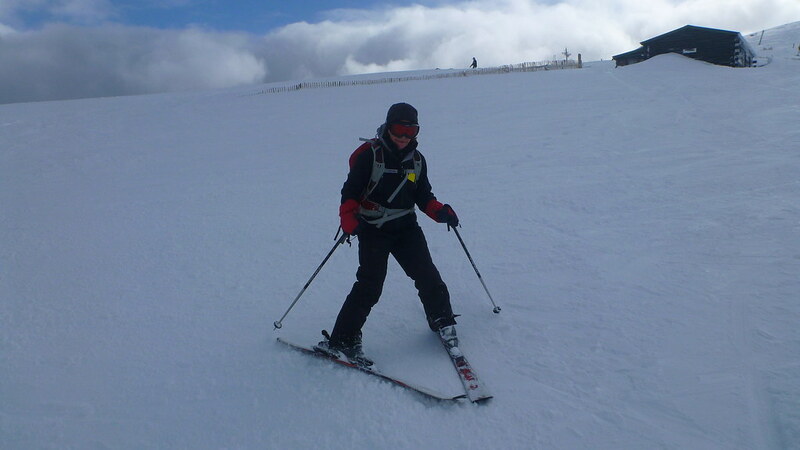 Like the previous couple of years we went skiing for a day at Glencoe Ski Area. 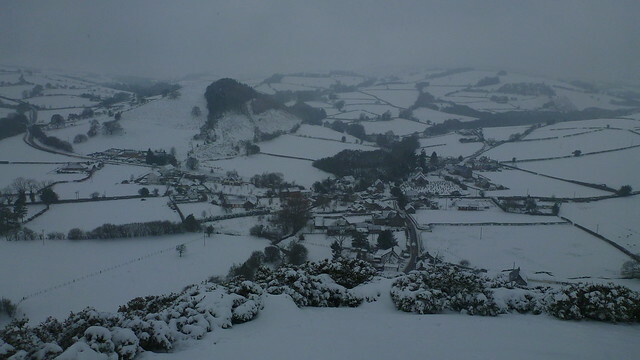 Last couple of years there has barely been enough snow. 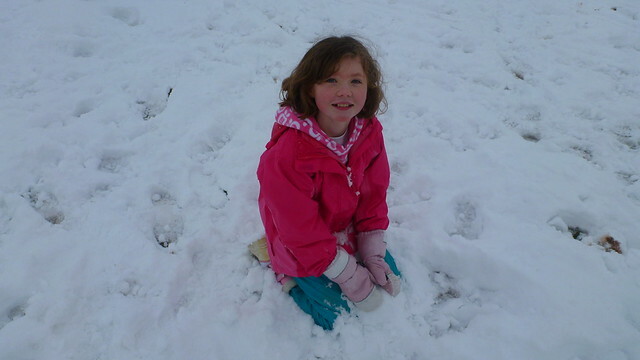 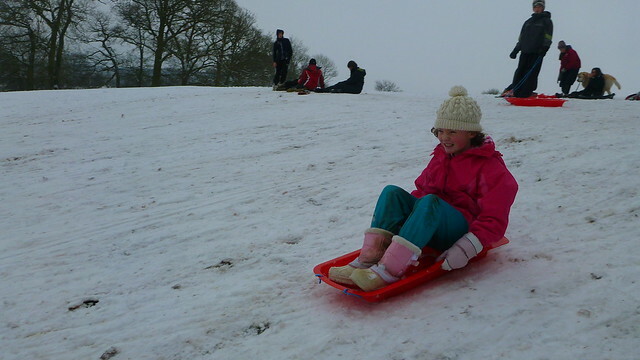 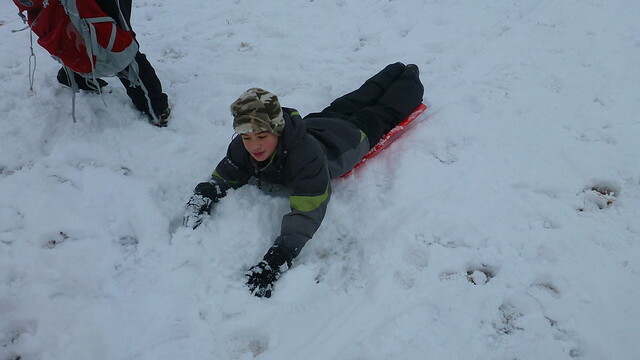 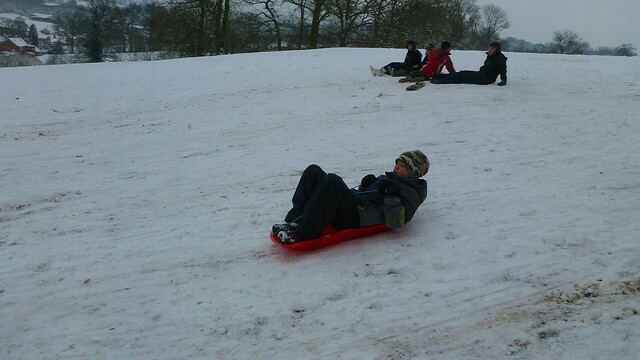 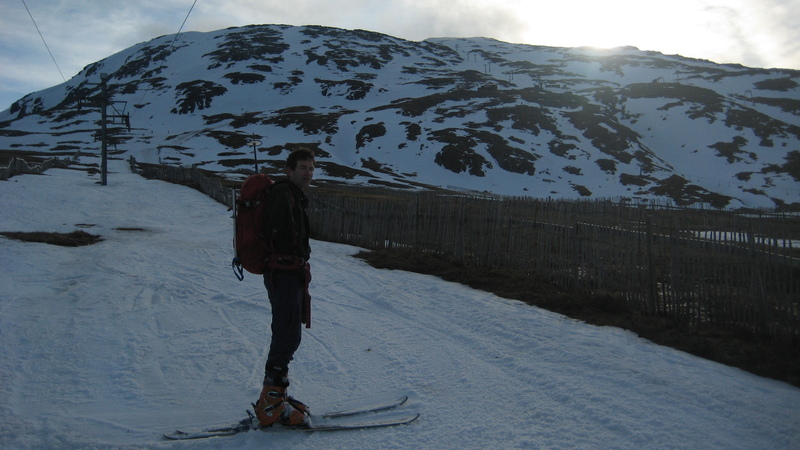 This year there was loads of snow, tonnes of the stuff, meters deep. 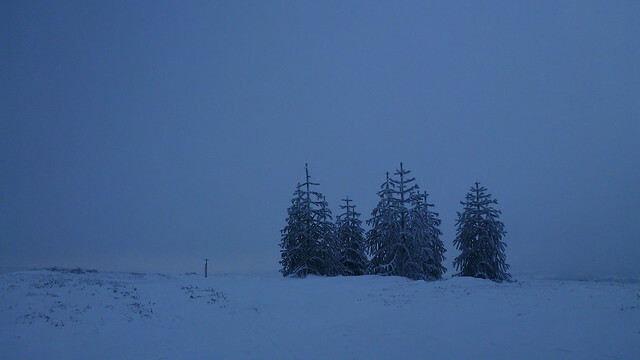 In fact too much. 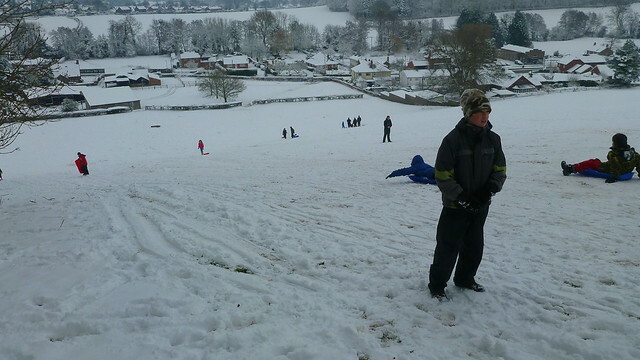 The tops lifts weren’t running as they were completely buried. 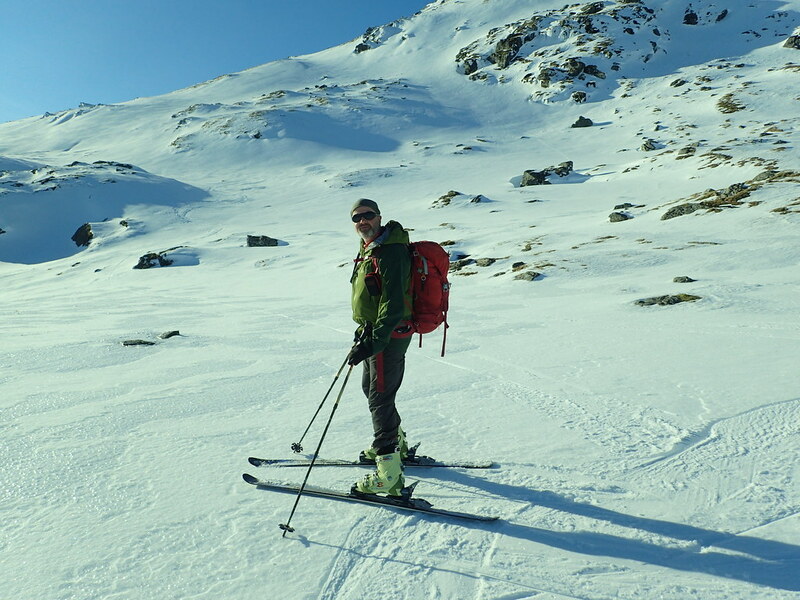 Me a GM did a little impromptu off piste touring to bag a small bump near the piste and escape the crowds. 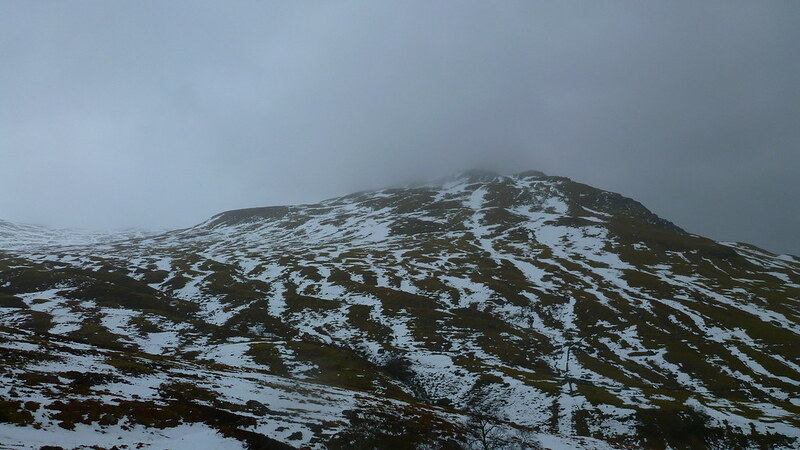 We were hoping for a grand tour across the Ben Lawers range and had left a car at the far end. 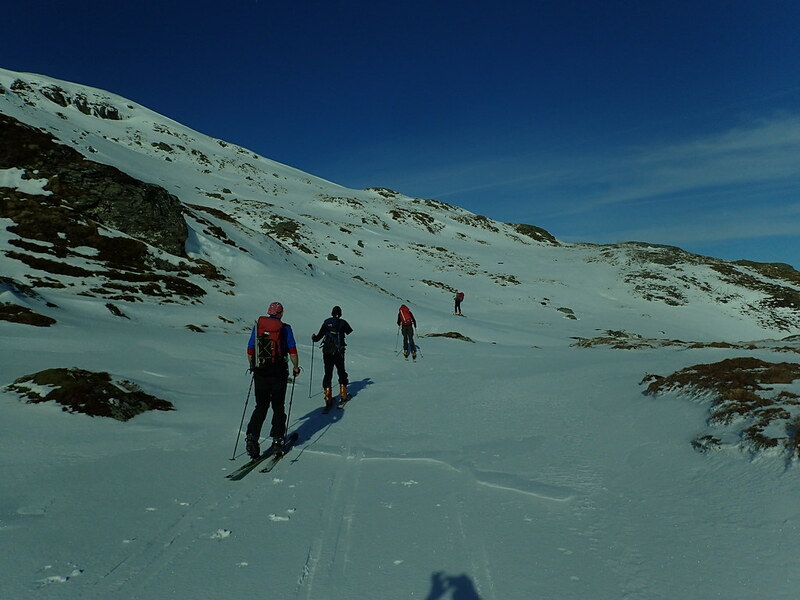 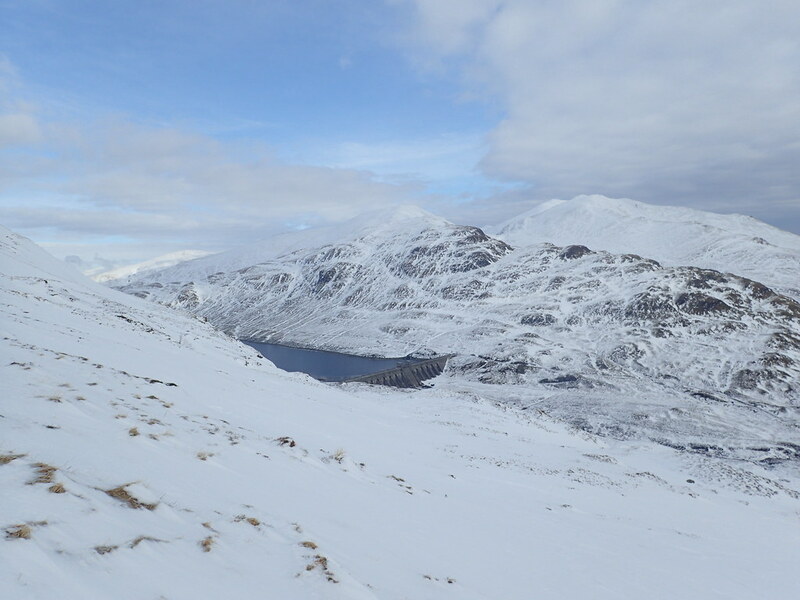 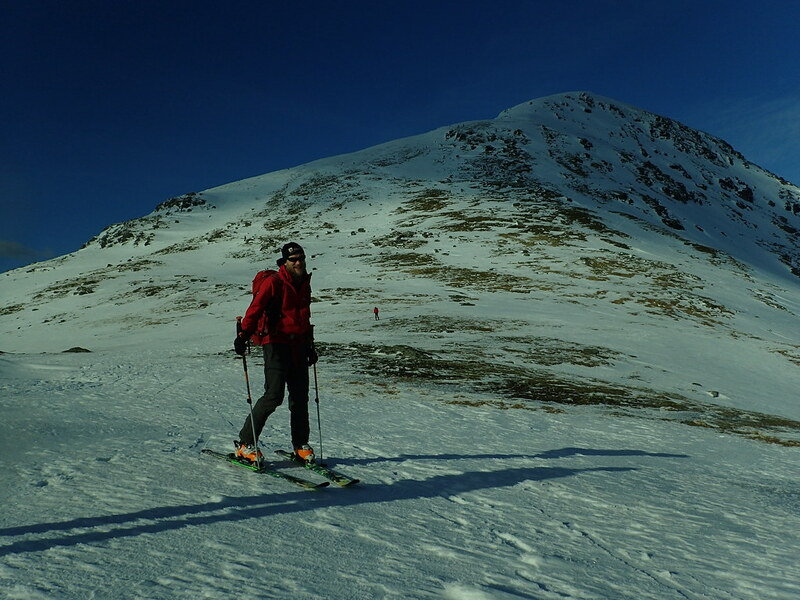 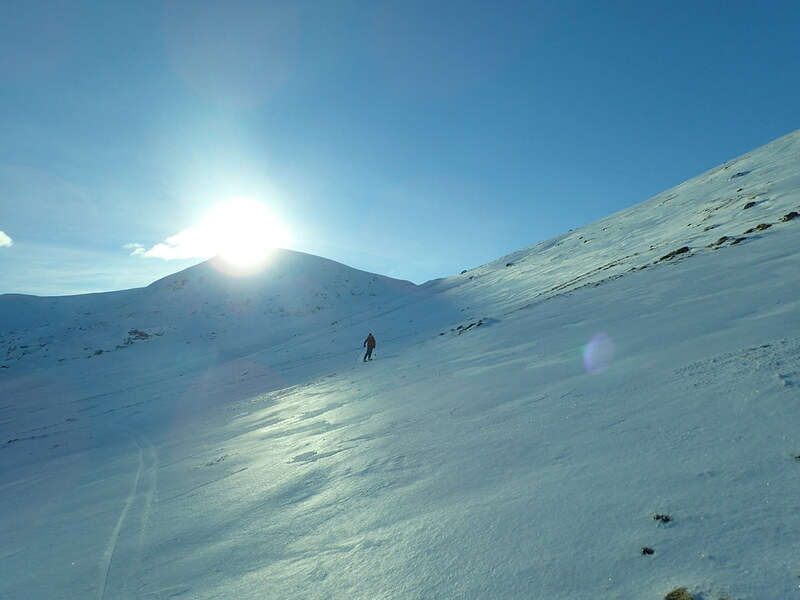 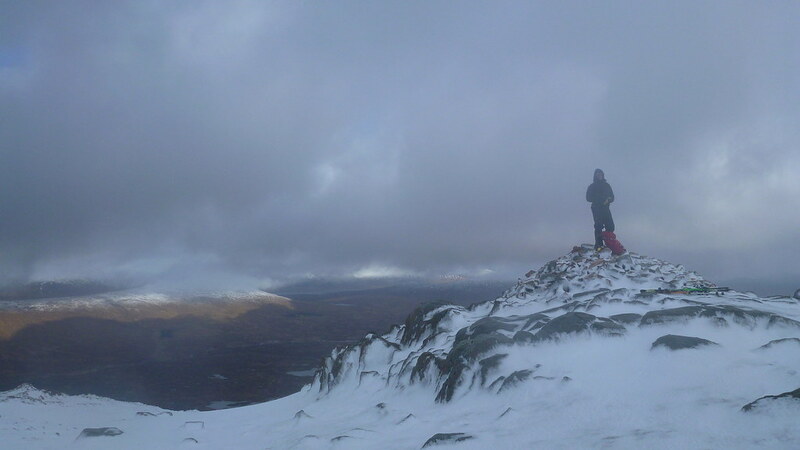 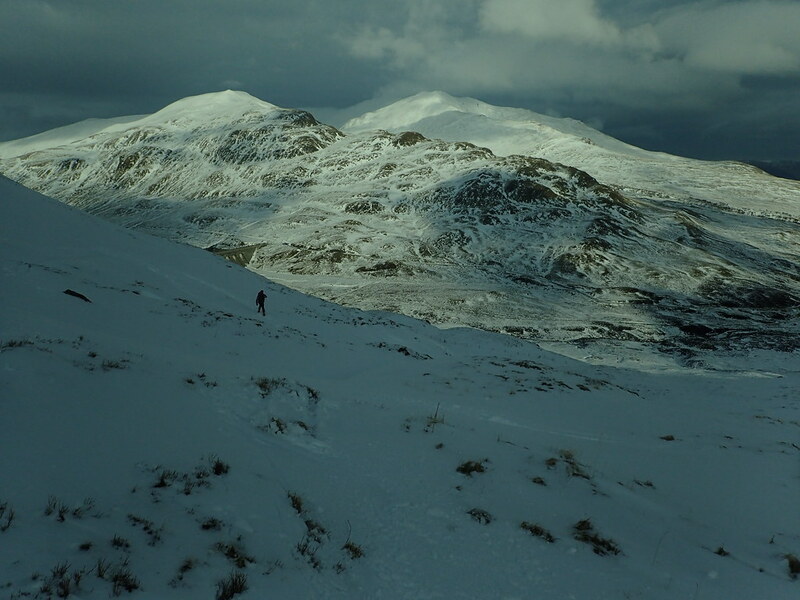 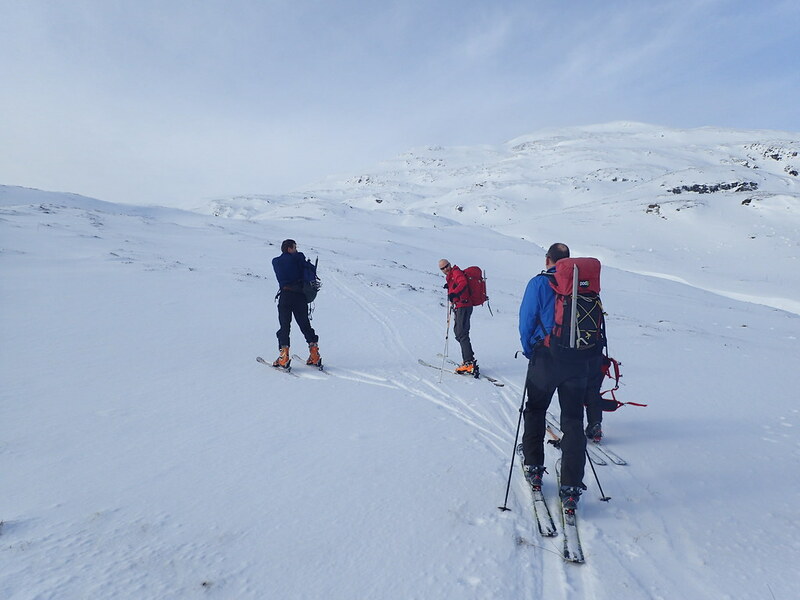 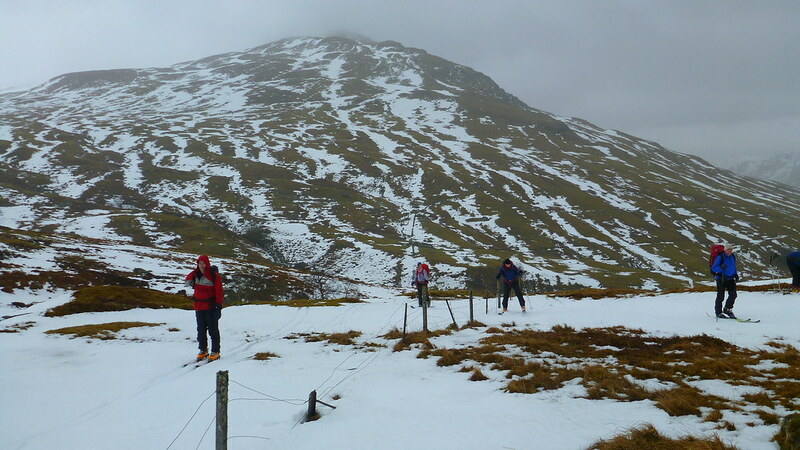 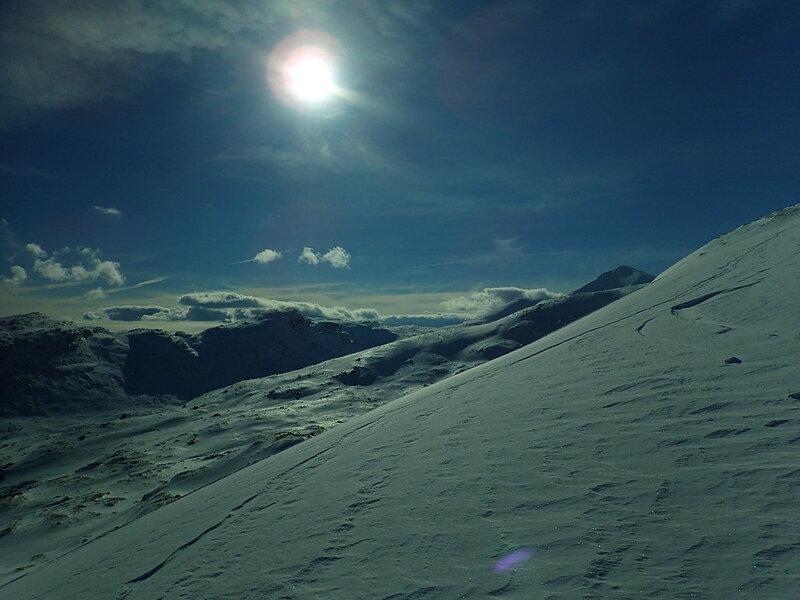 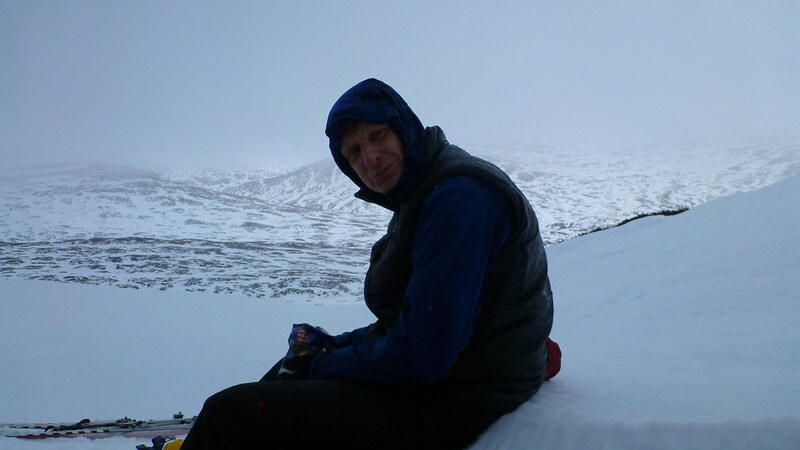 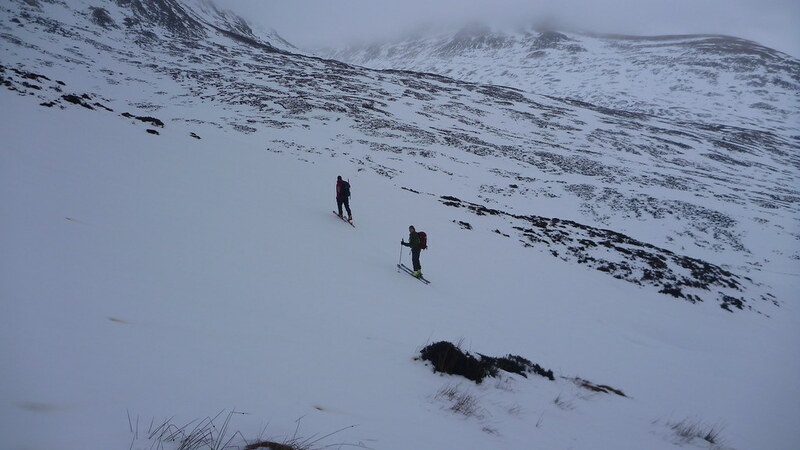 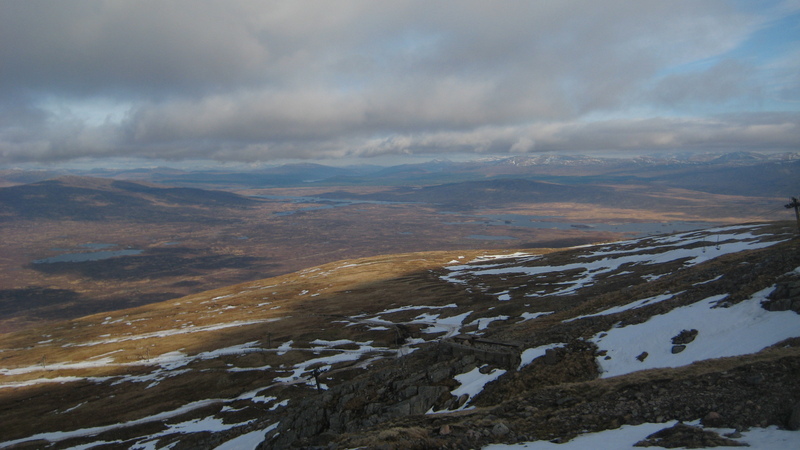 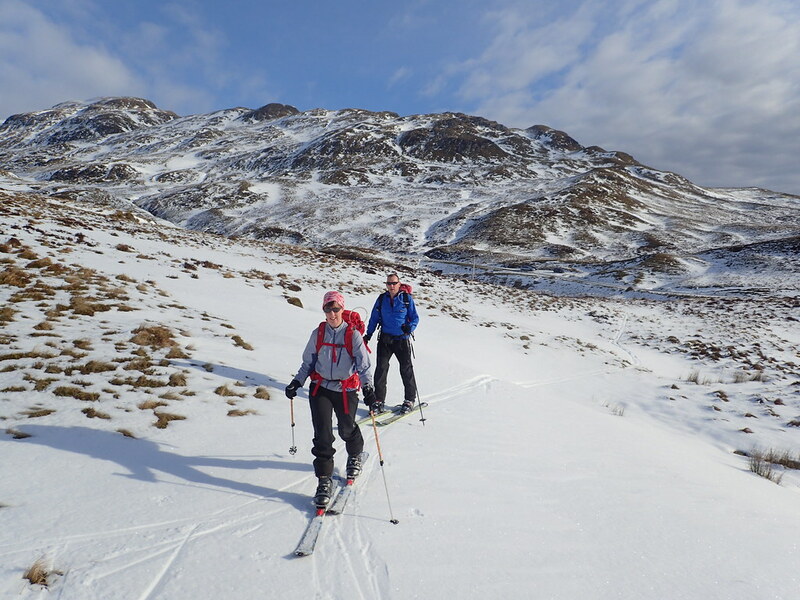 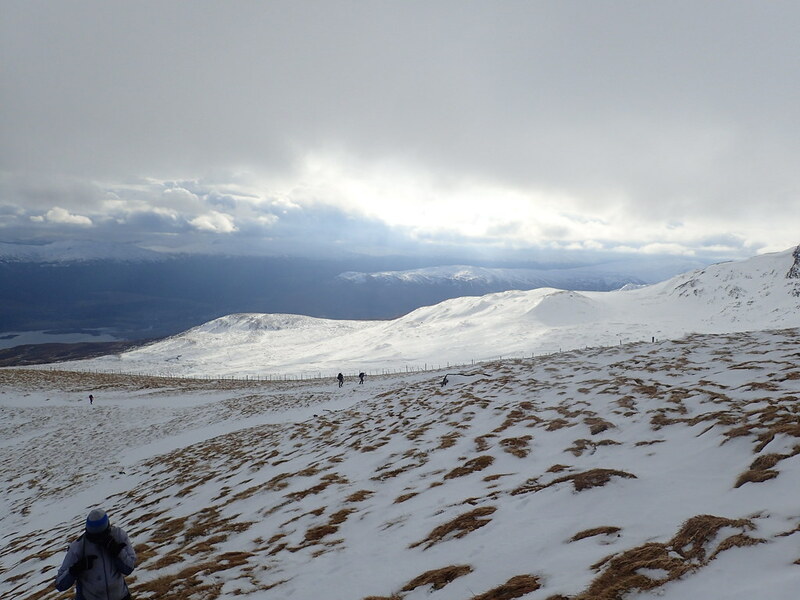 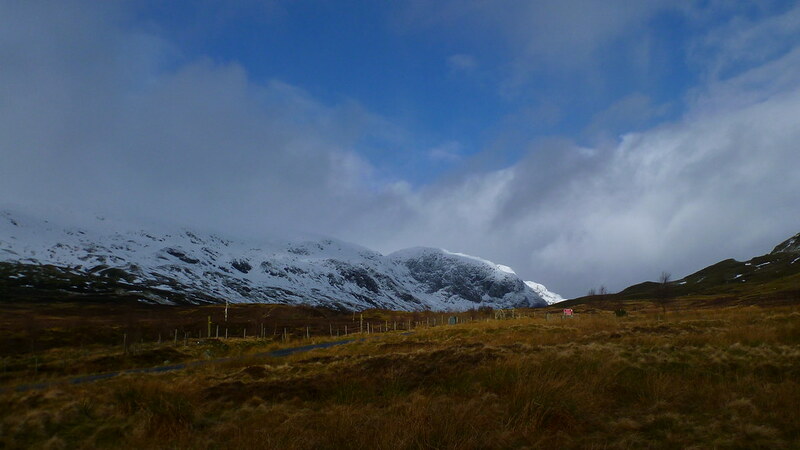 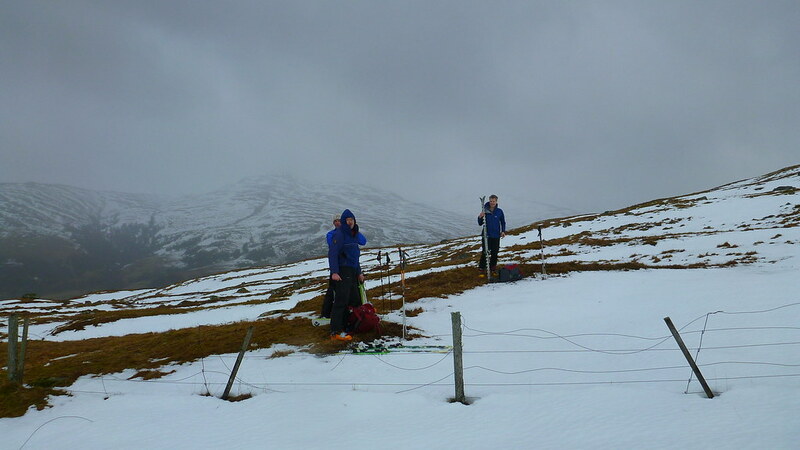 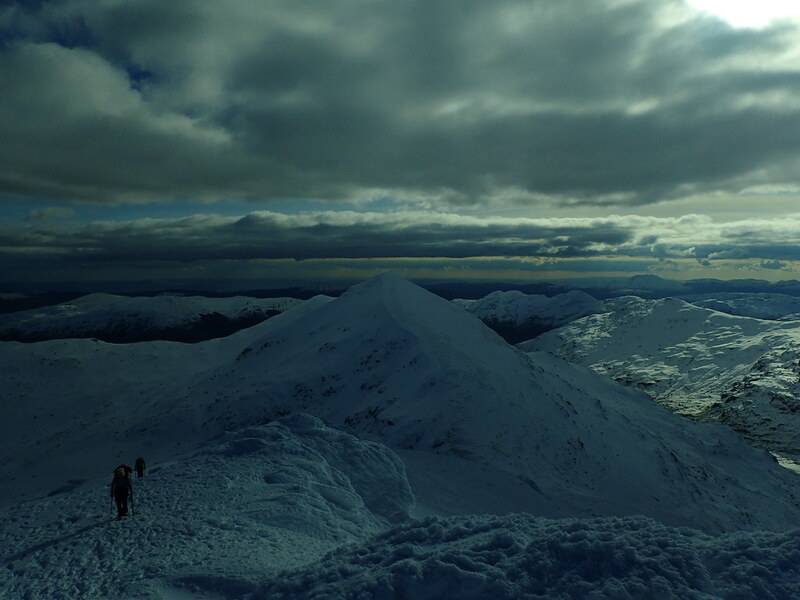 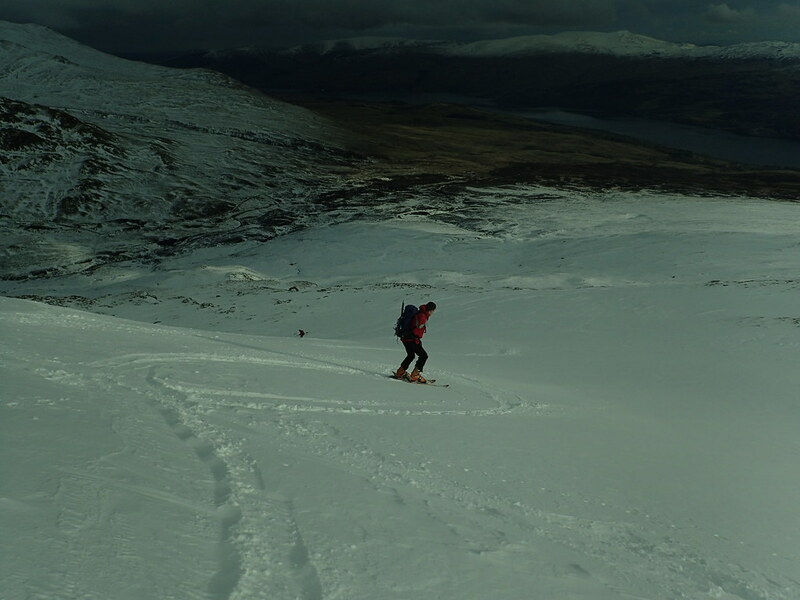 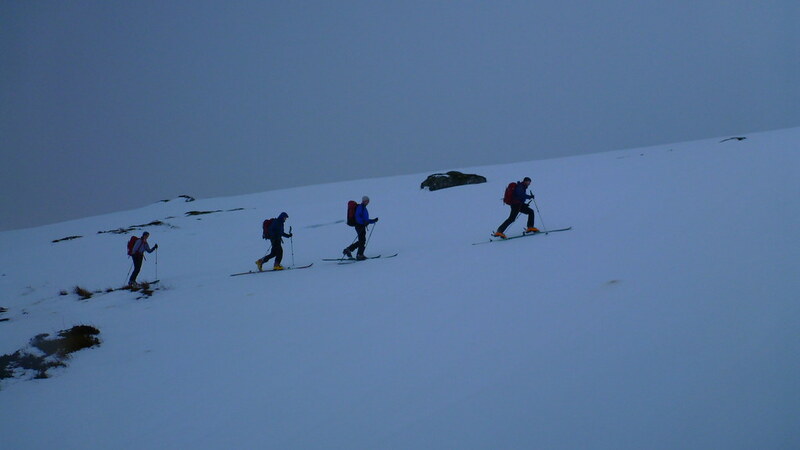 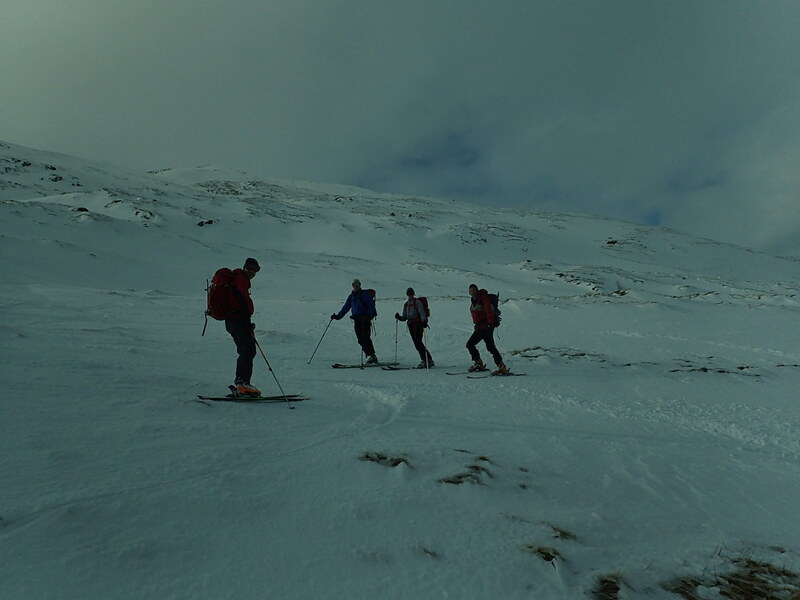 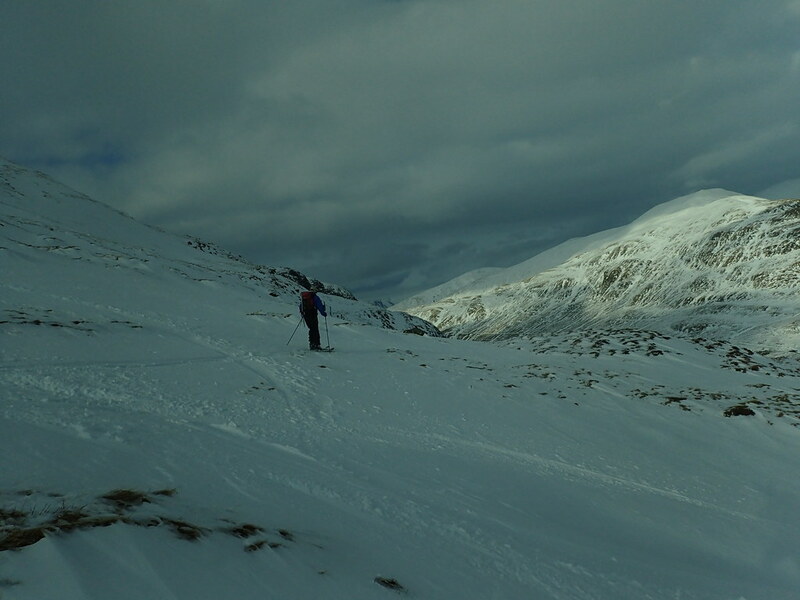 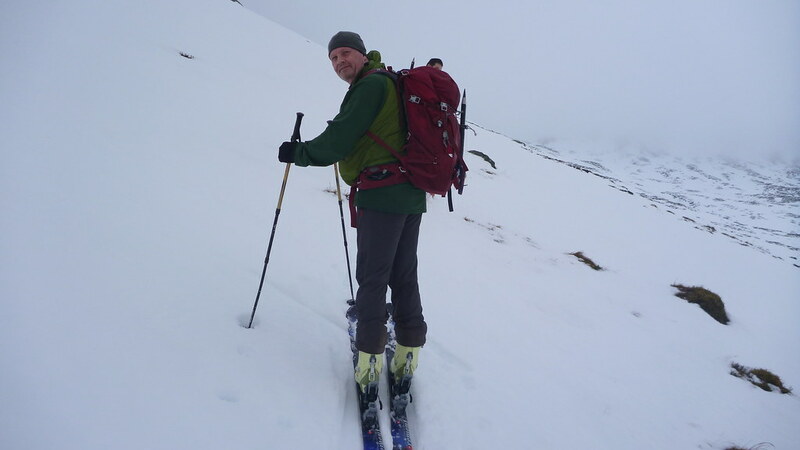 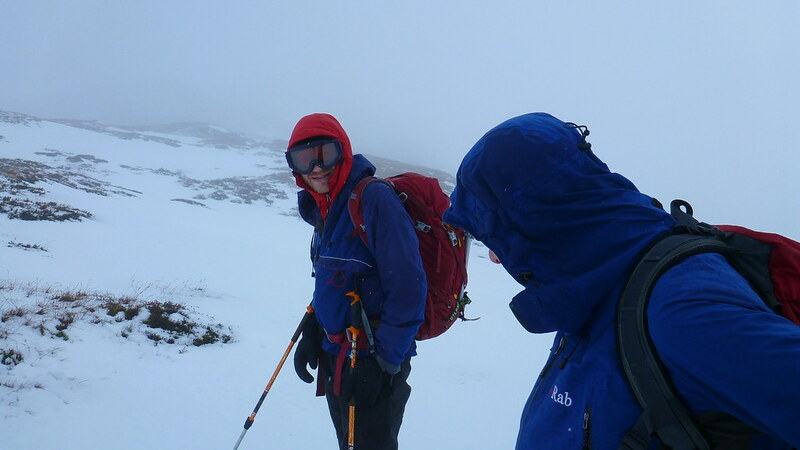 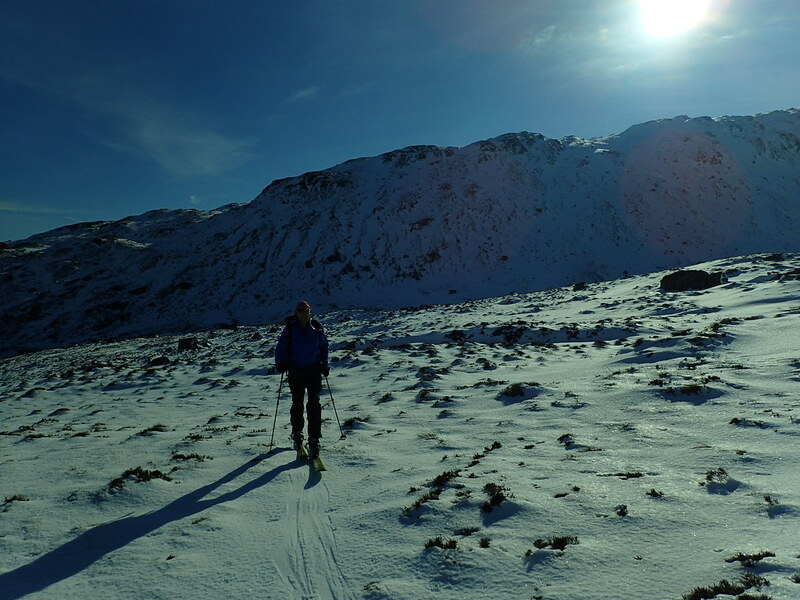 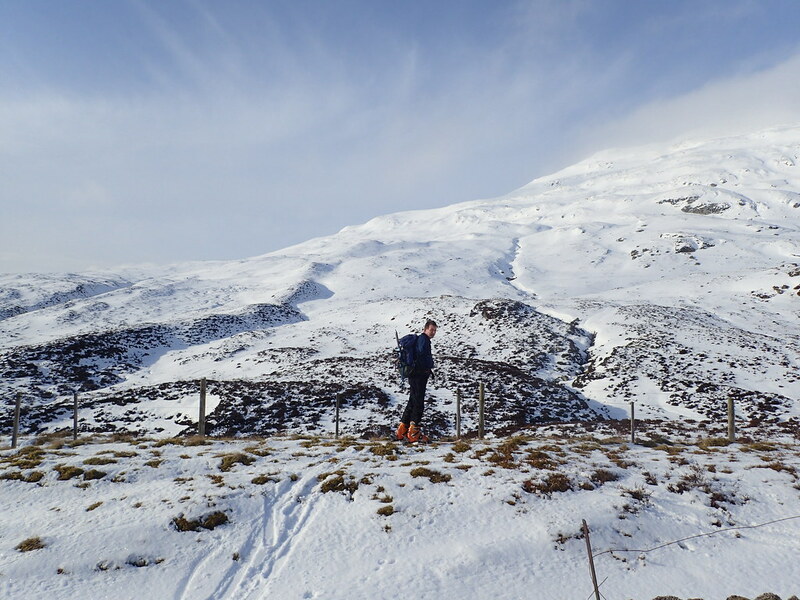 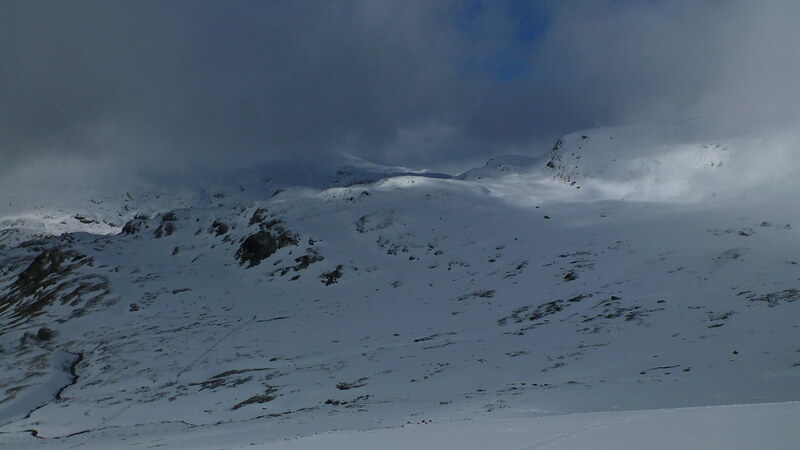 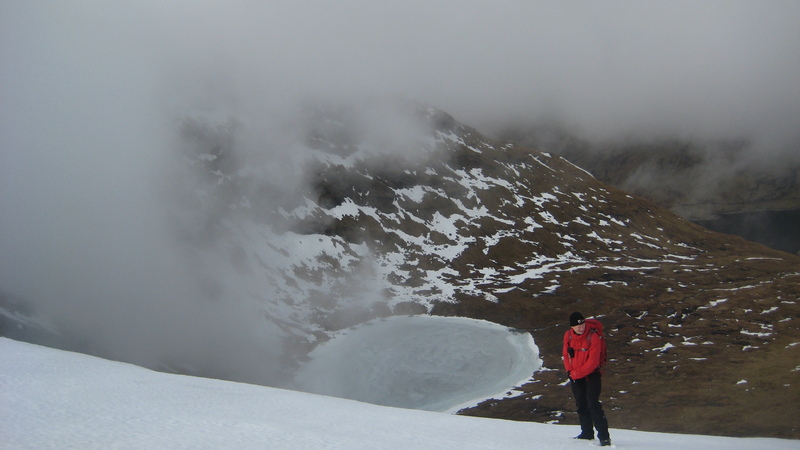 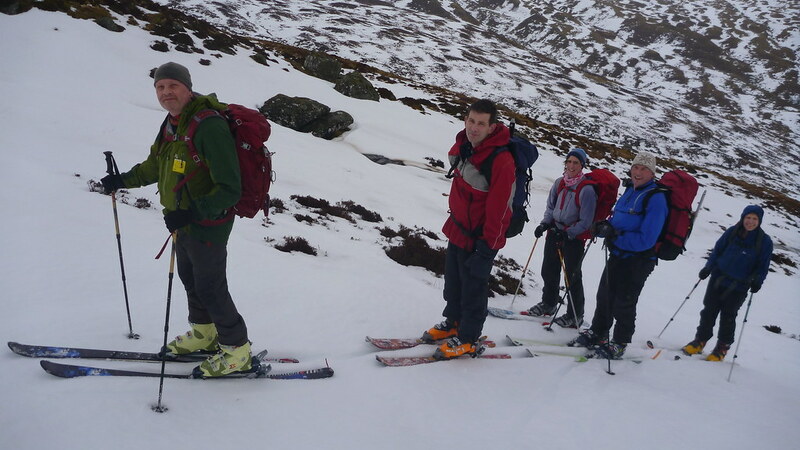 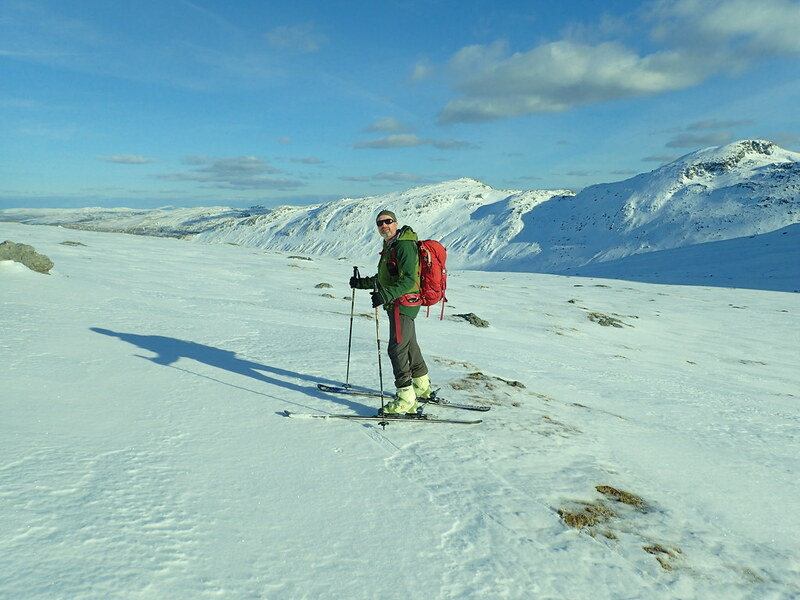 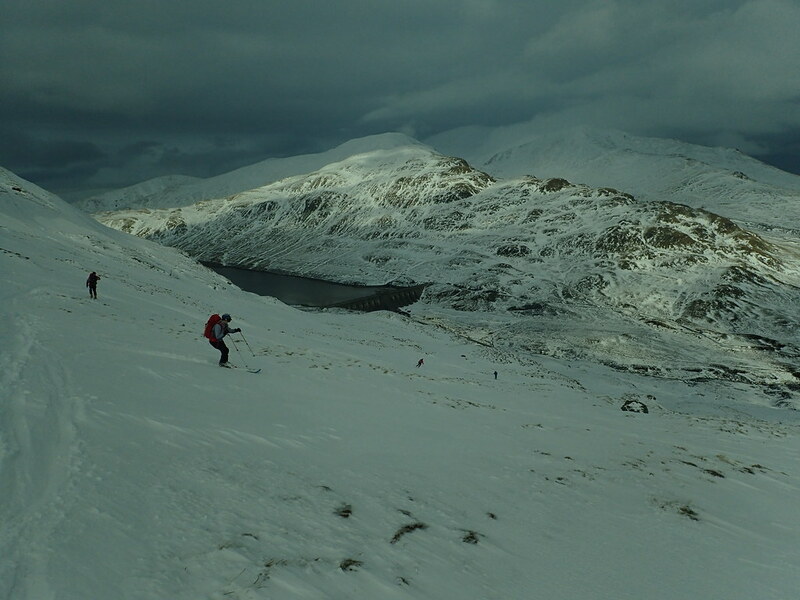 Once out of the nature reserve and onto the snow the conditions were great and we made swift progress up to Beinn Ghlas. 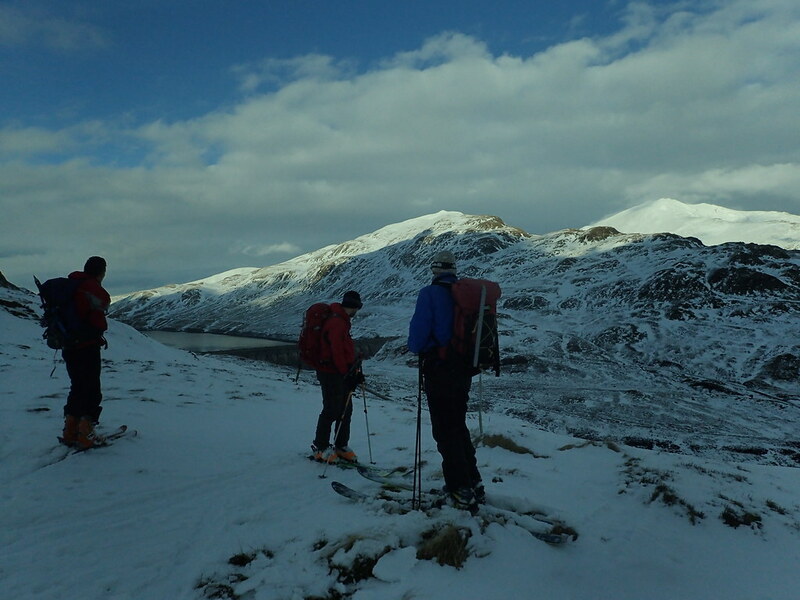 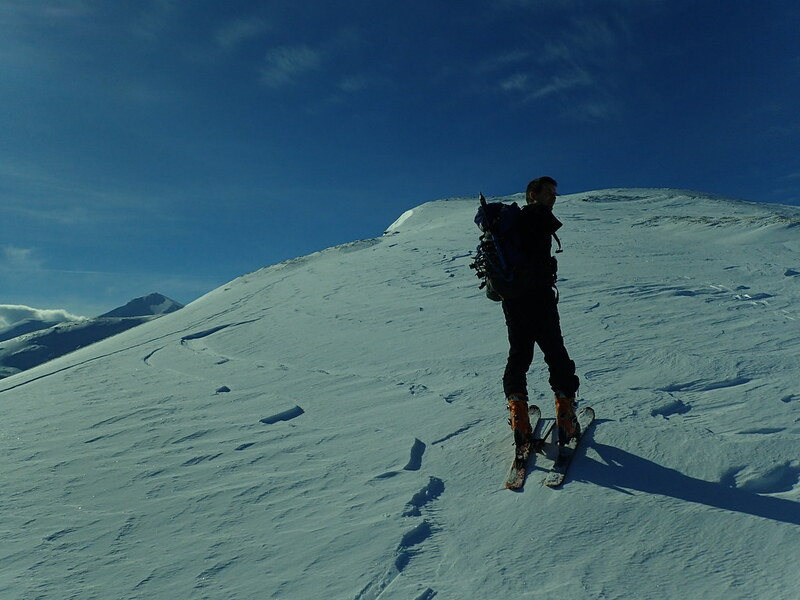 For our final day we headed south to tackle Ben Venue. 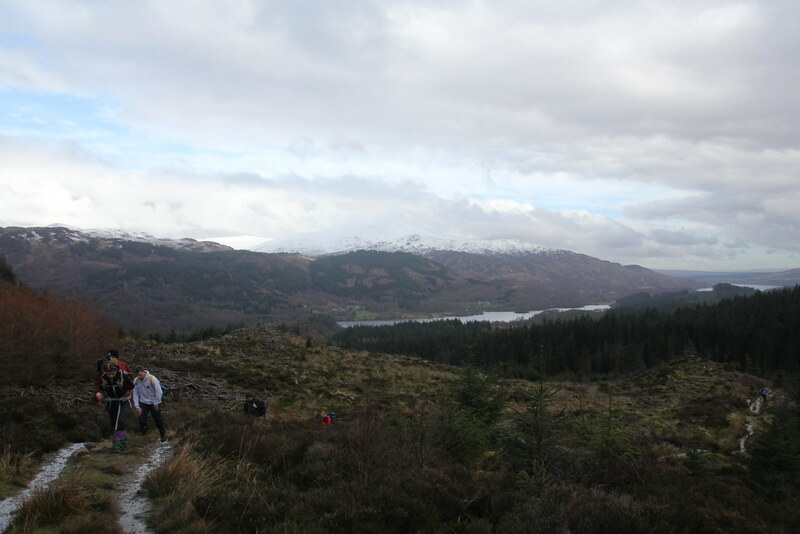 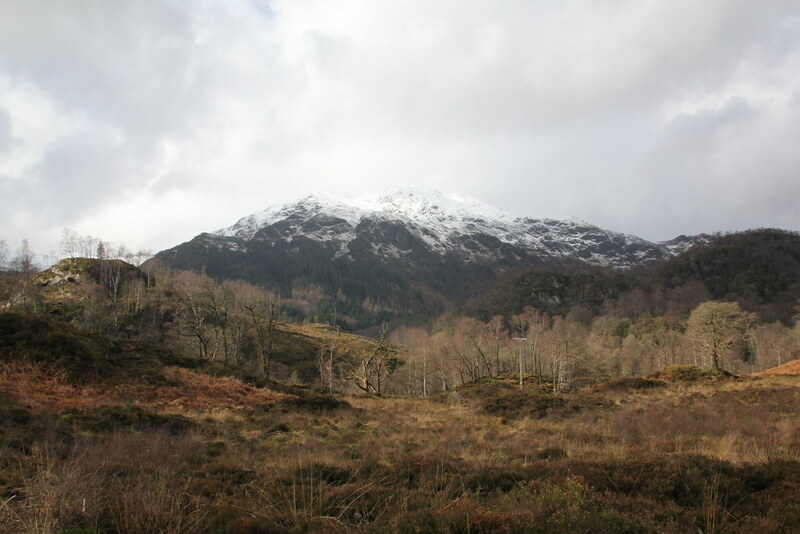 I’d never walked much in the Trossachs and I was looking forward to the walk as Ben Venue has often caught my eye. 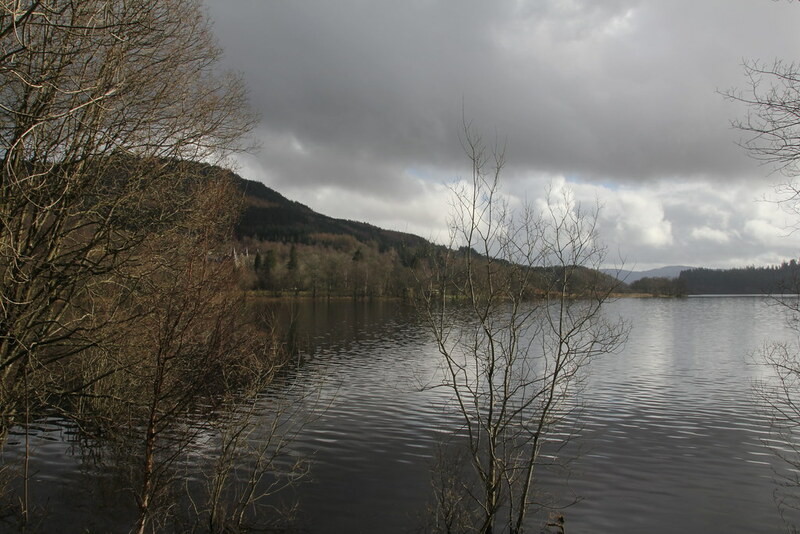 The weather forecast wasn’t great but the sun was out when we parked up and the views along Loch Achray were grand. 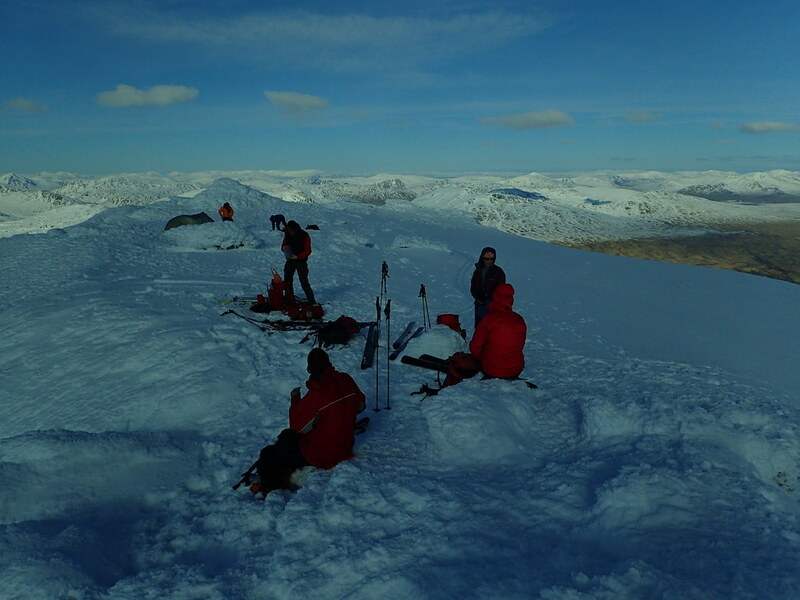 Time for brief summit photo and then off back down. 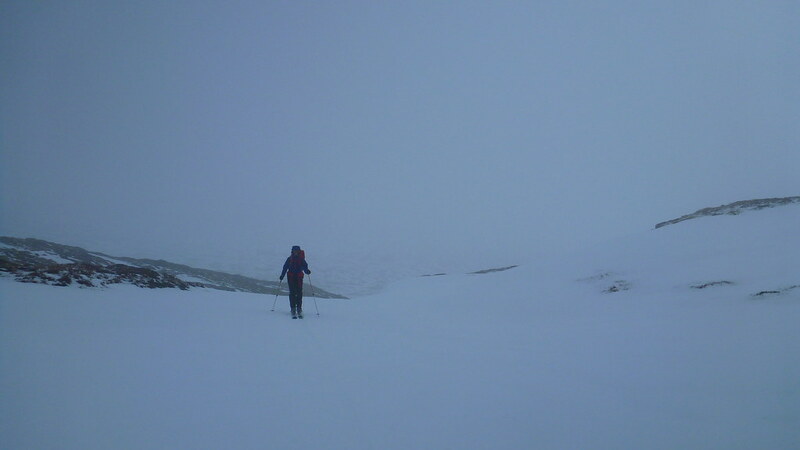 The walk along the rocky ridge was interesting and I’m sure its a fine high level traverse in clear conditions but it was pretty grim this day. 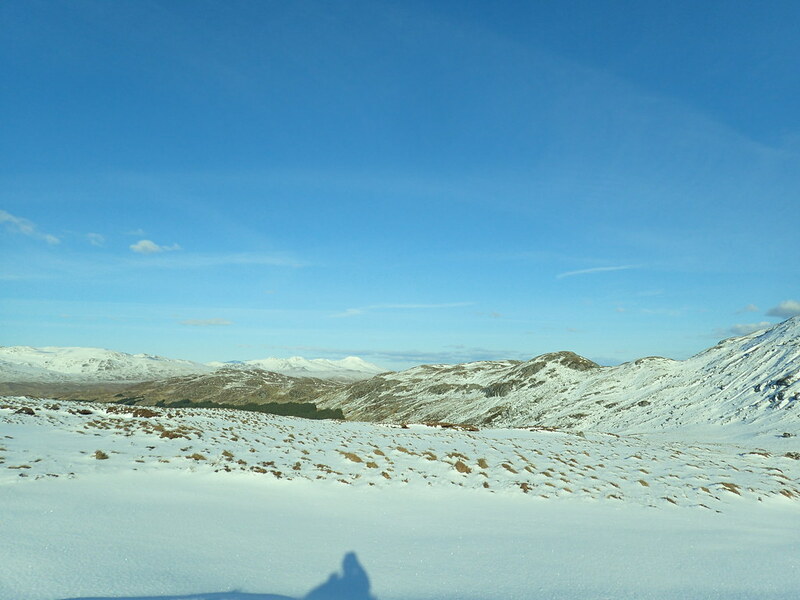 For the past few years our tribe of ex- Manchester University students (plus honoured guests) have been heading up to Scotland for a winter weekend getaway from the pressures – sorry – pleasures of family life. 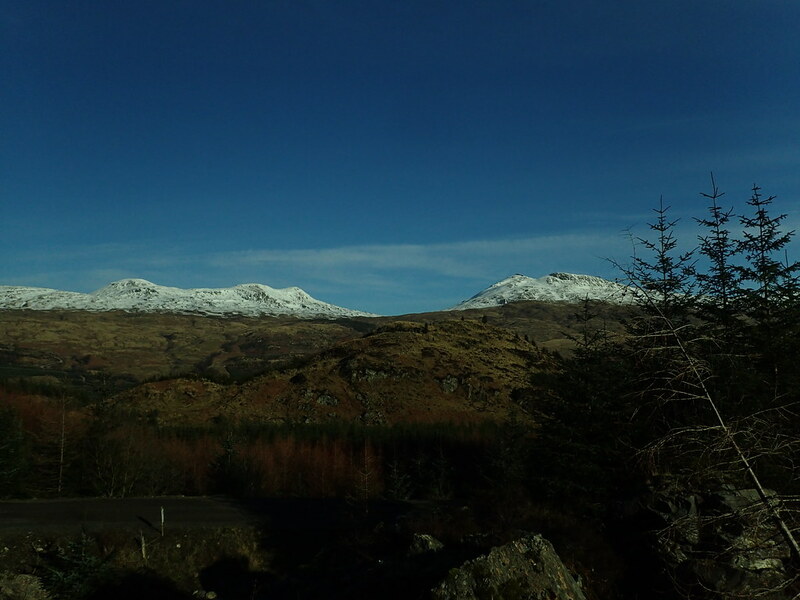 This is the sixth year we’ve done it and previously we’ve stayed in a cheap but not very cheerful hotel near Crianlarich. 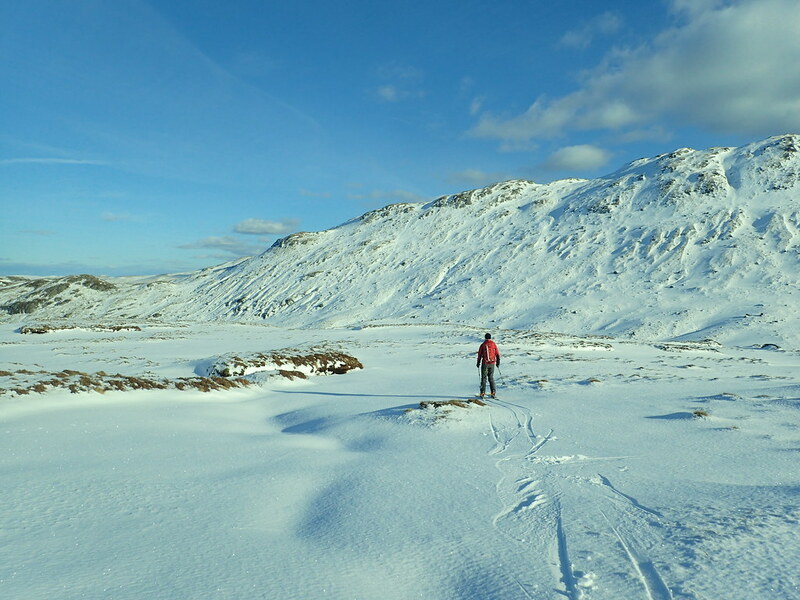 This year we decided to splash out and try a new hotel and we weren’t disappointed. 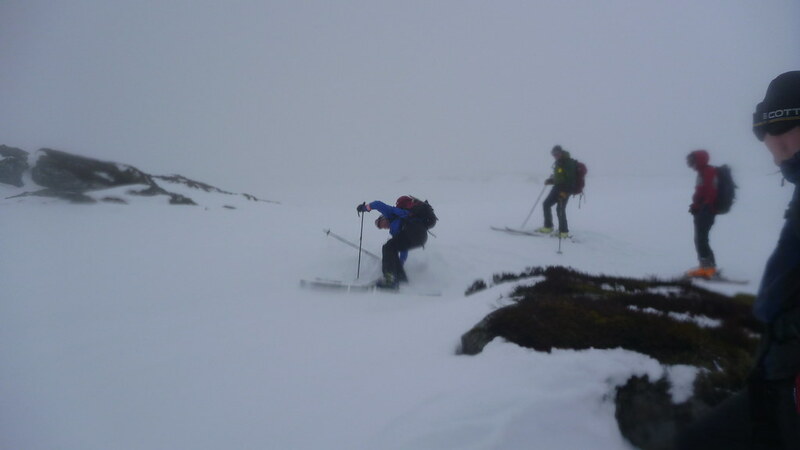 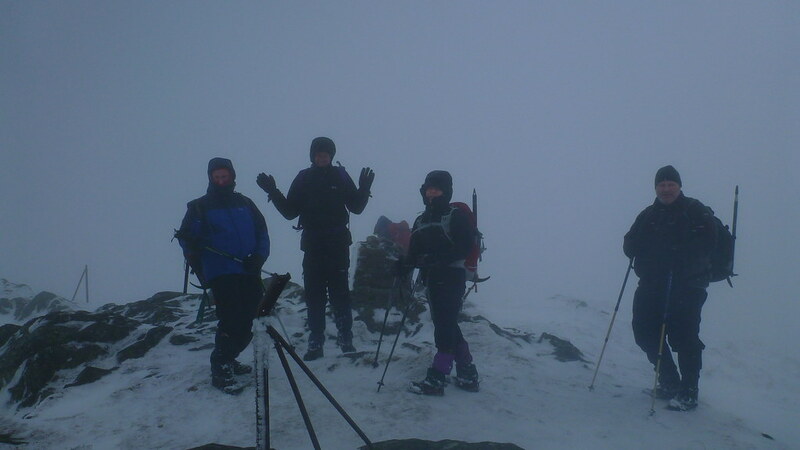 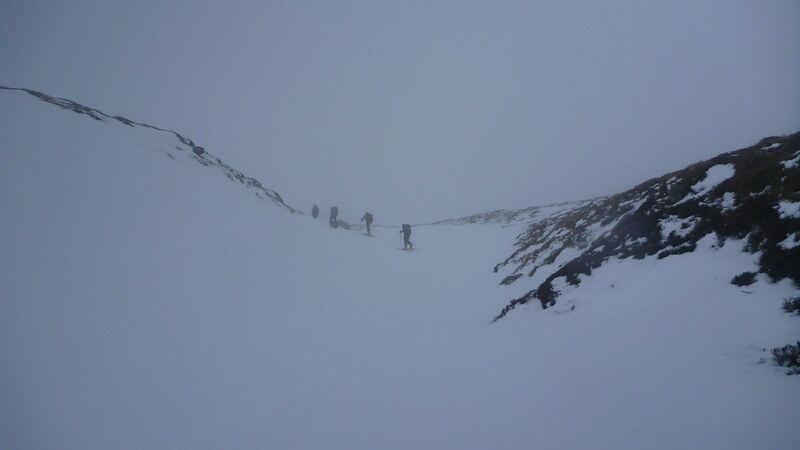 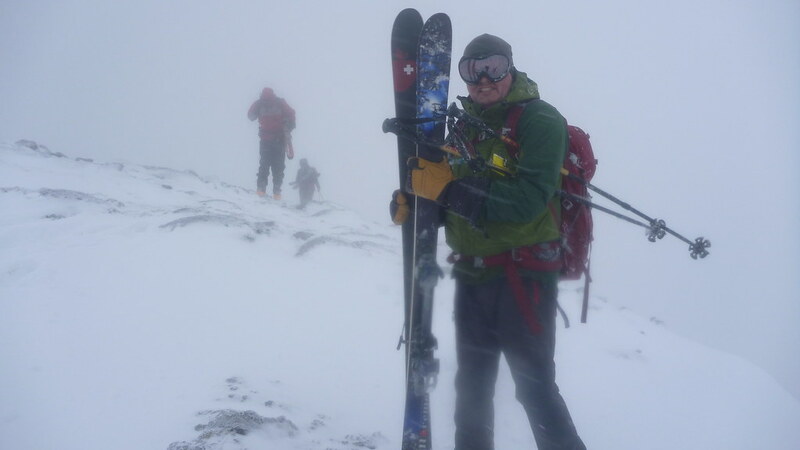 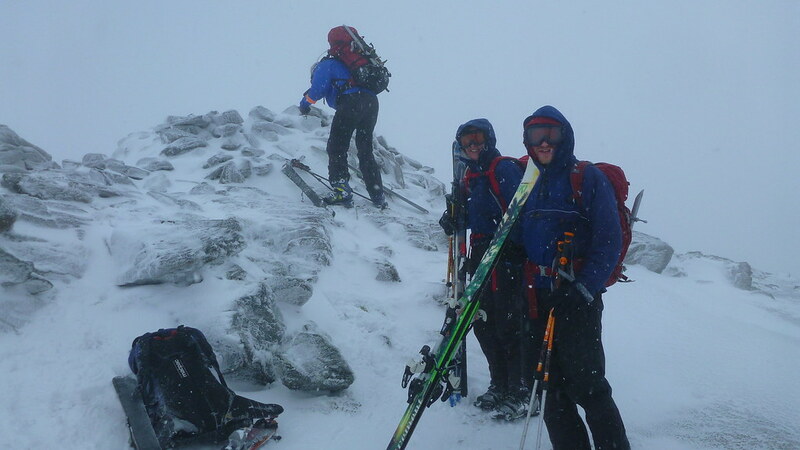 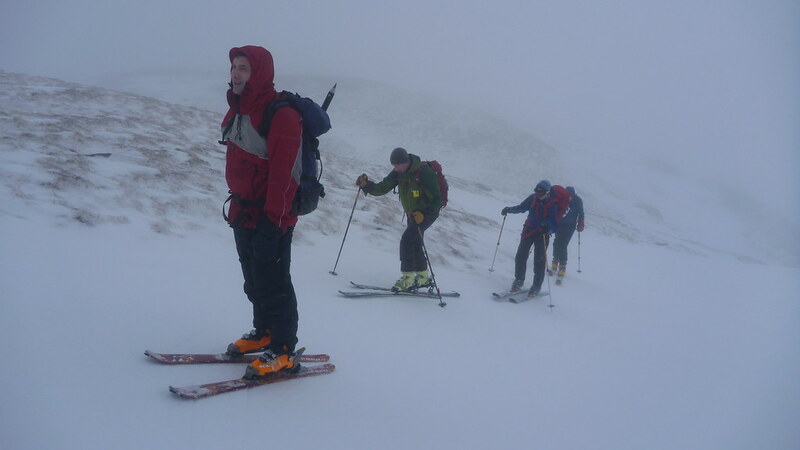 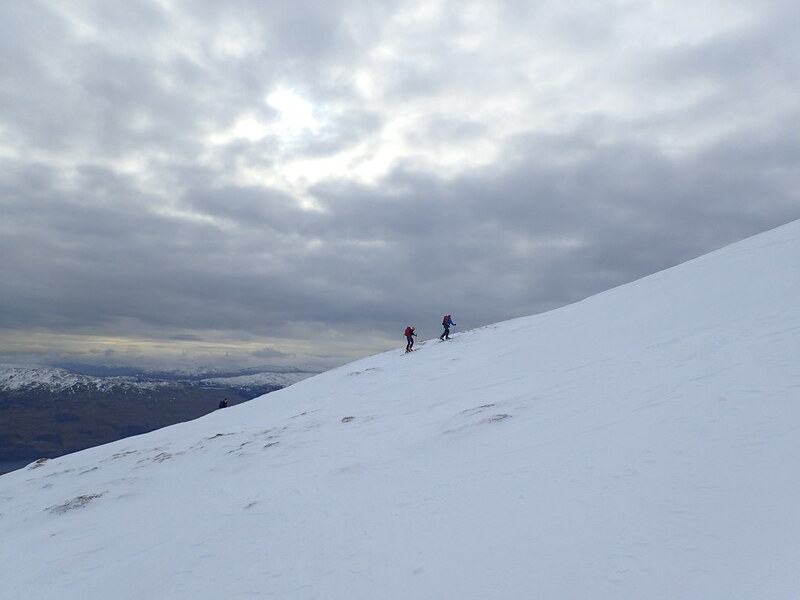 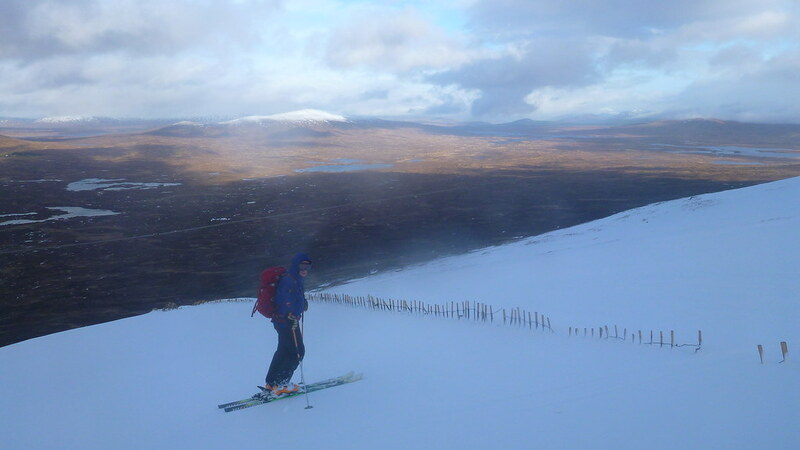 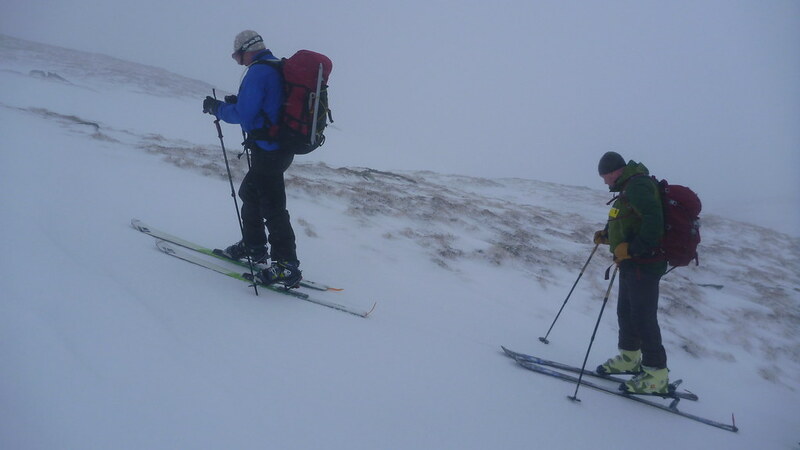 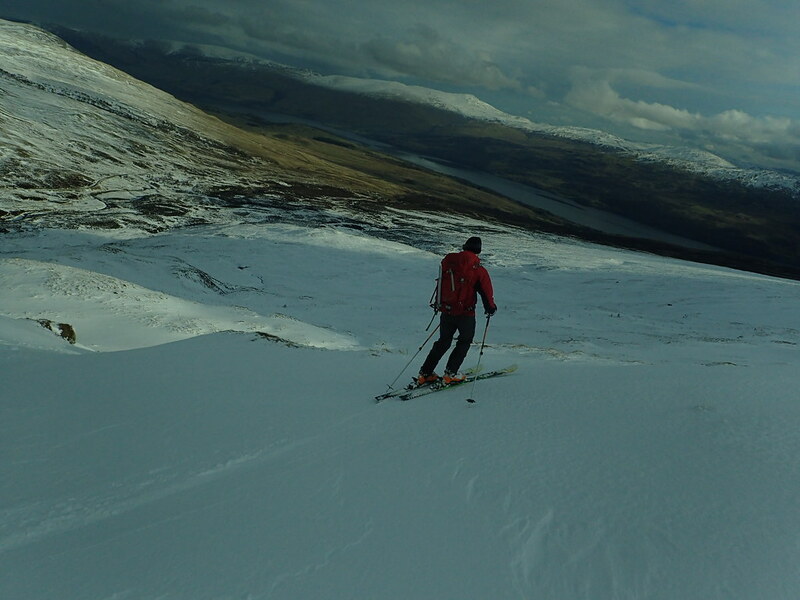 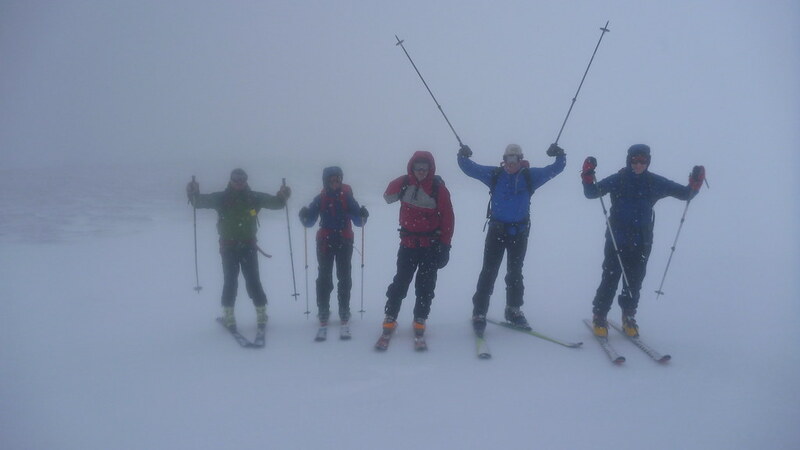 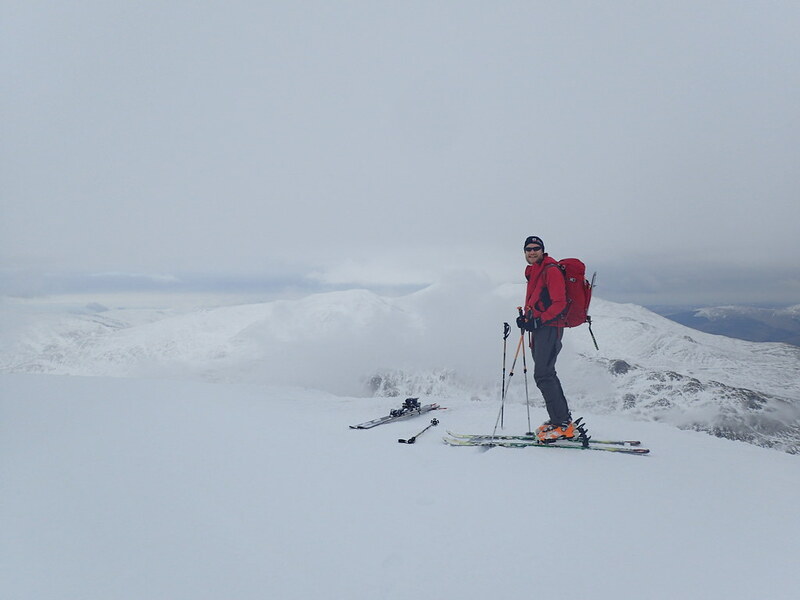 Once above 6oo metres at the mid station it was clear there was enough snow for some fun so after a couple of brief runs low down we put the skins on and headed up to the top of Meall A’Bhuridh in overcast but bright and dry conditions. 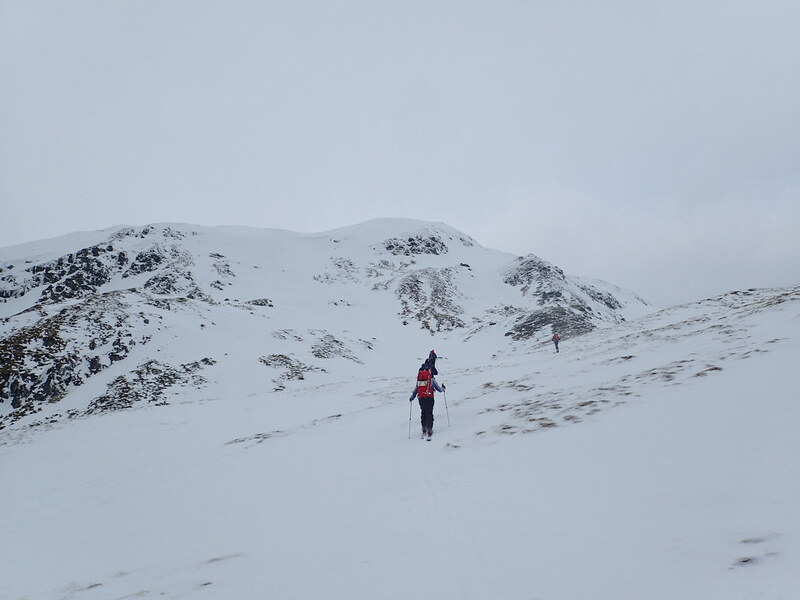 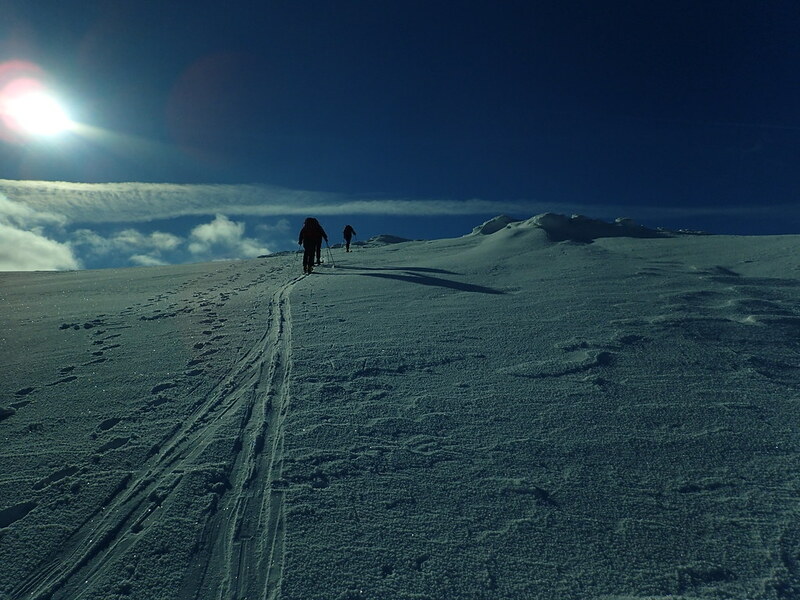 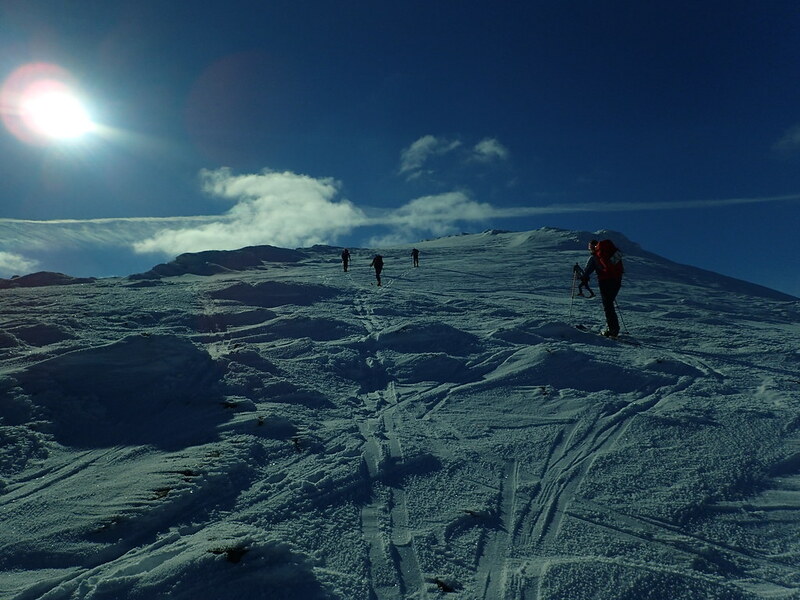 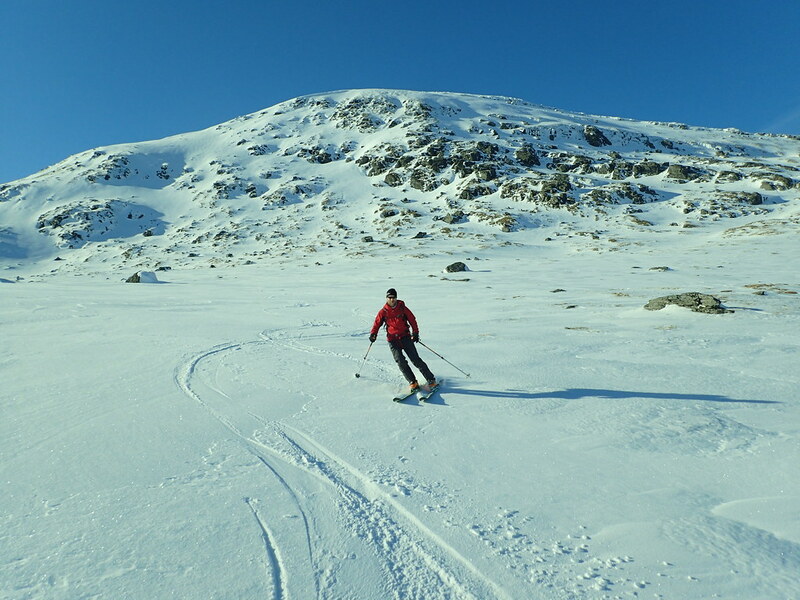 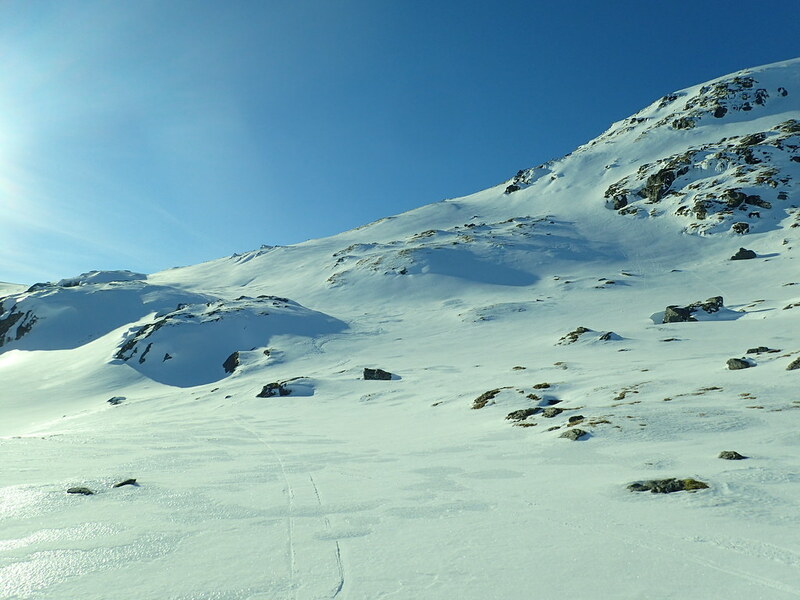 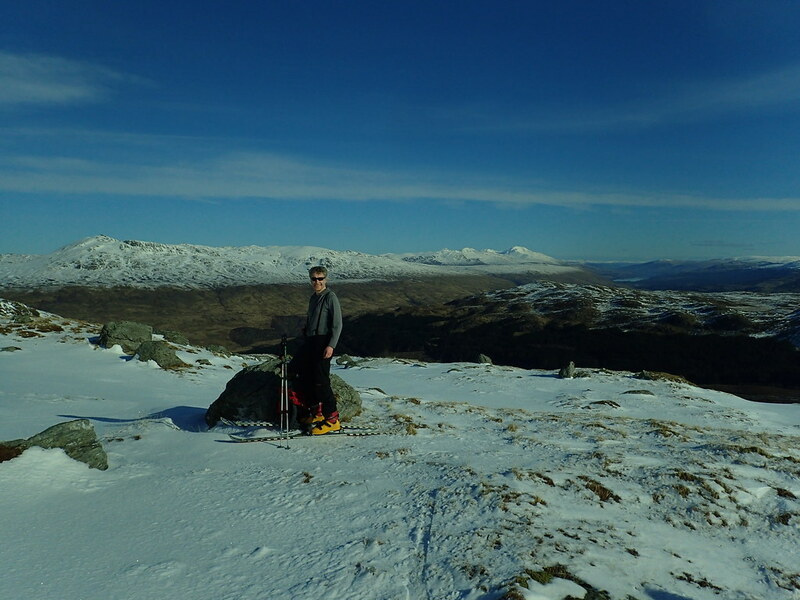 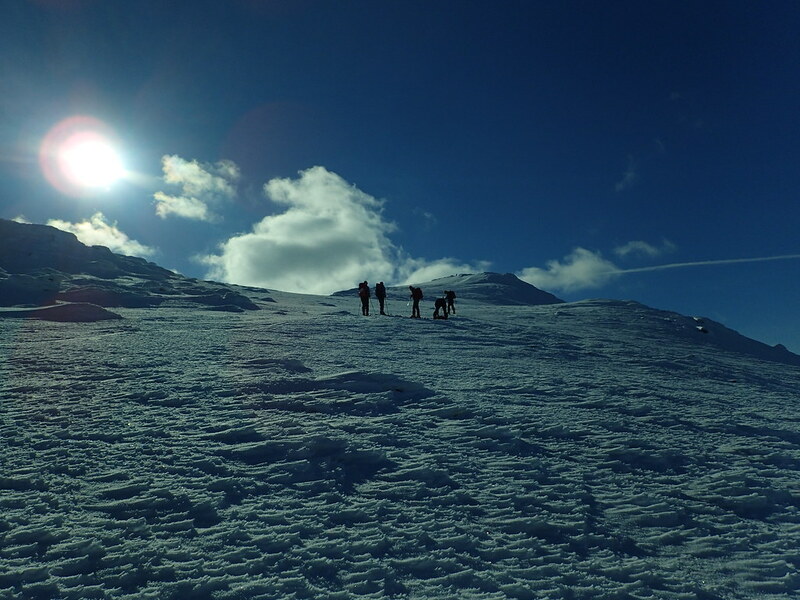 It’s munro number 209 for me and despite GMs protestations that using the ski lift to get half way doesn’t count I’m claiming it – especially as we skinned up it twice this day. 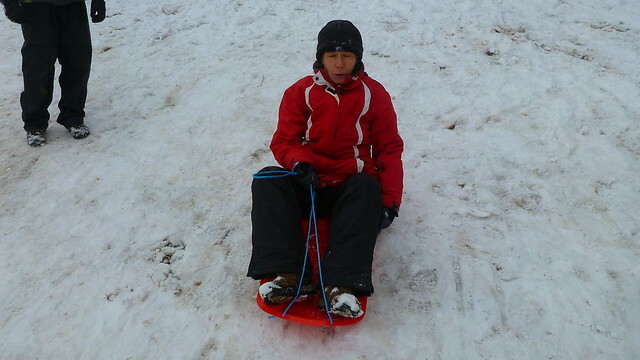 We’d been playing with my Headcam during the day and the collected footage is below. 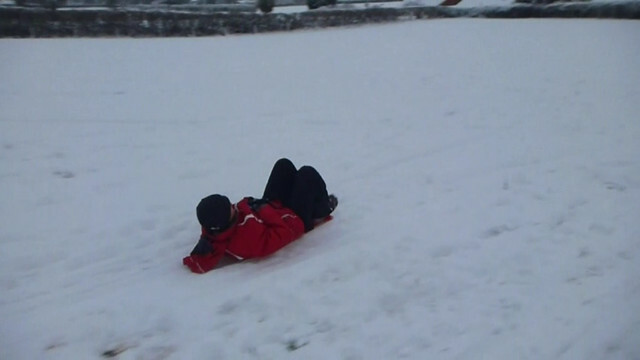 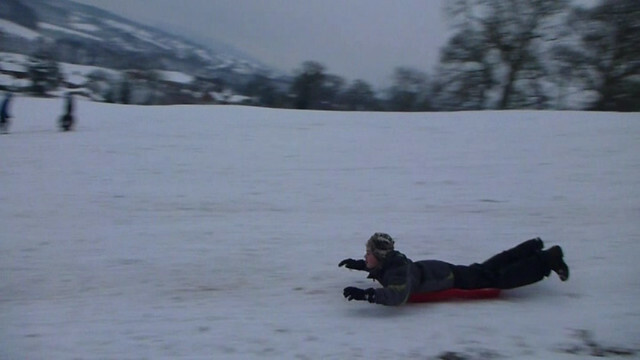 Still need some practice getting the angles right but it is a fantastic way to relive the days fun. 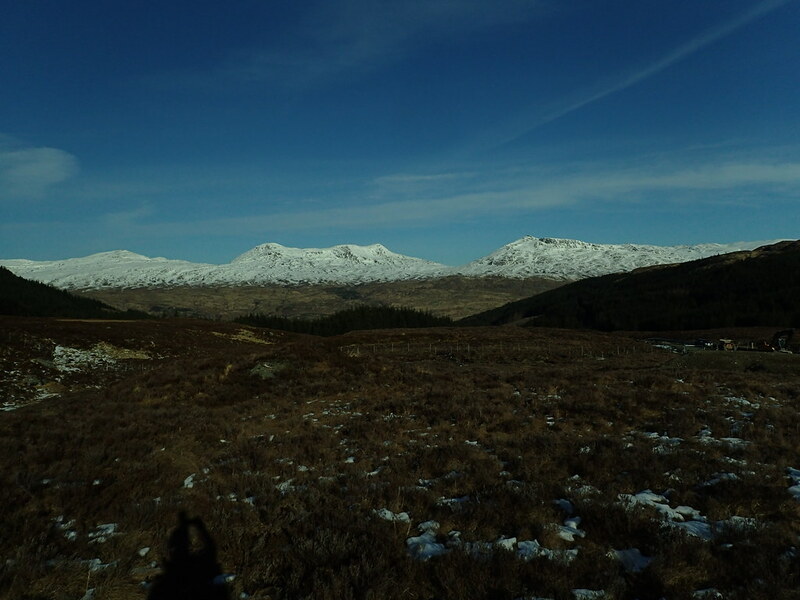 We drove back across to our weekend hotel under a cloudless sky with awesome views of the Blackmount, Ben Dorain and Ben More. 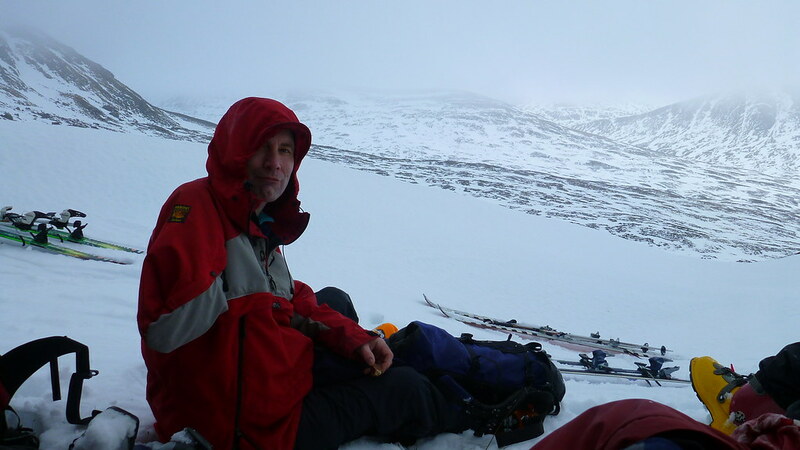 We arrived at at the Suie Lodge Hotel to a warm welcome ready for a few beers and a hearty meal to await the arrival of the rest of the posse. 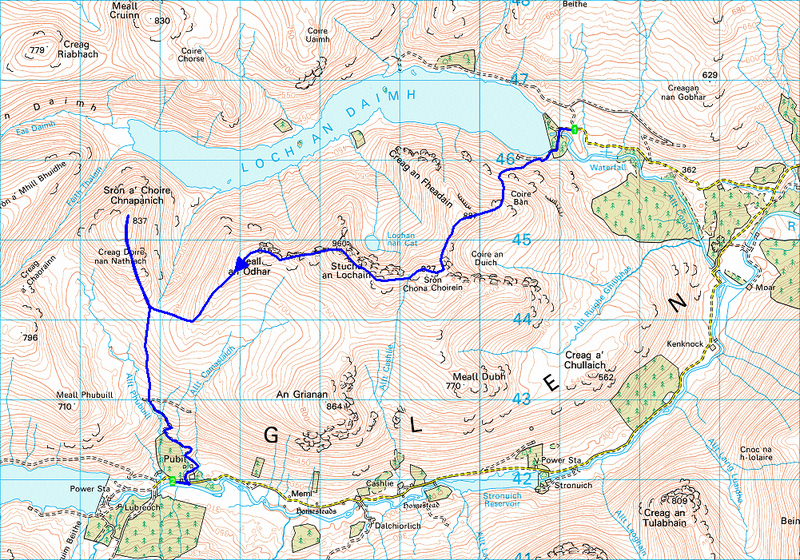 By 11pm the numbers were complete minus, alas, UF who had been struck down by nasty case of “feeling a bit glandy”. 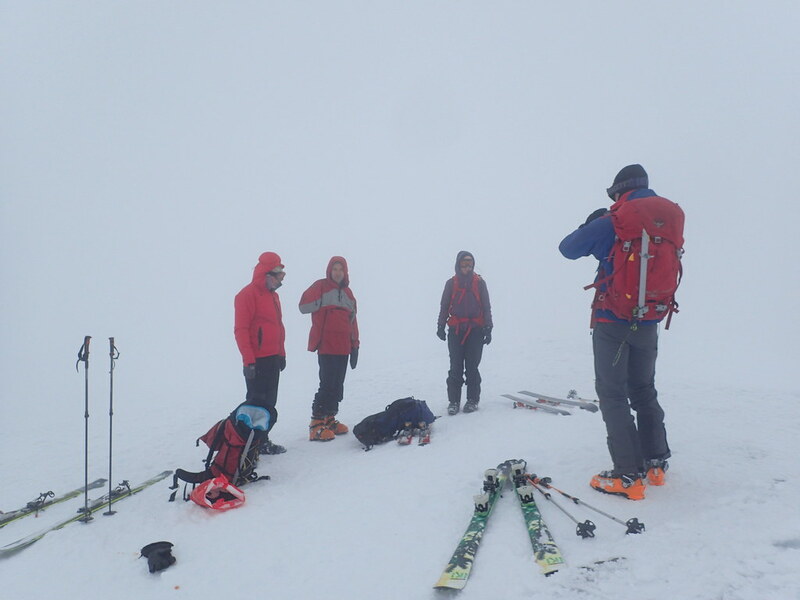 After we’d recovered from the shock, wiped away the tears and raised a glass to our missing comrade, we proceeded to take the p**s out of him for the rest of the weekend. 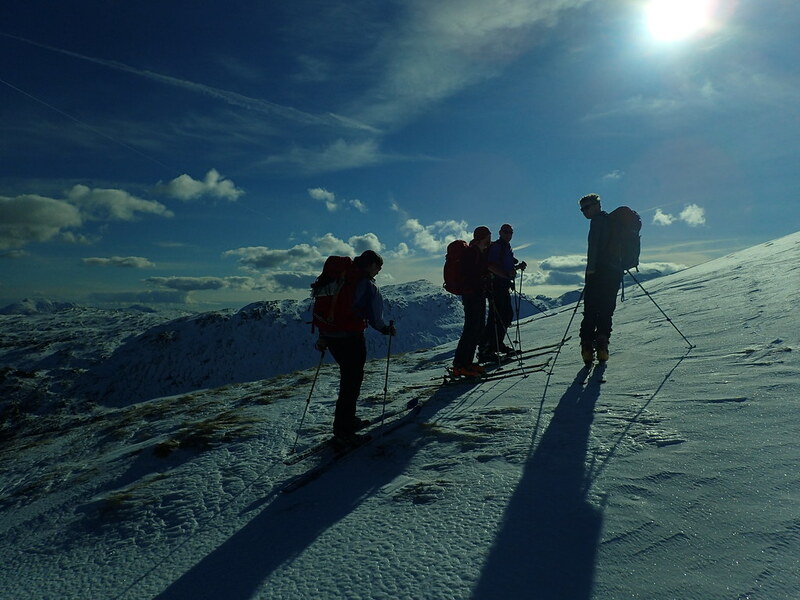 UF – we salute you!! 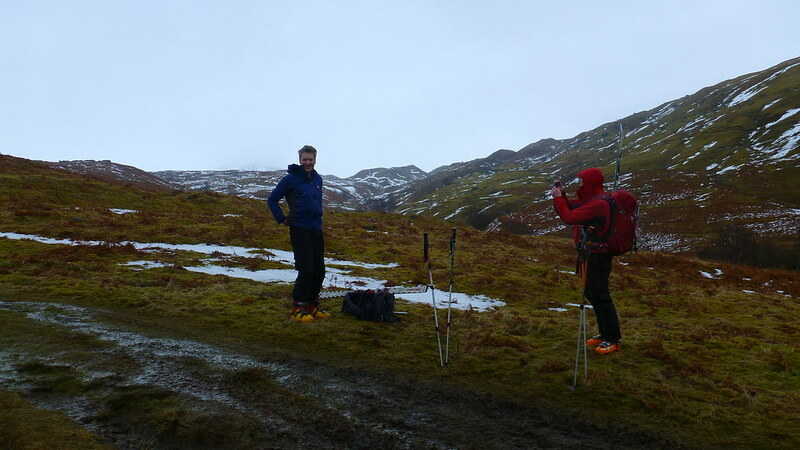 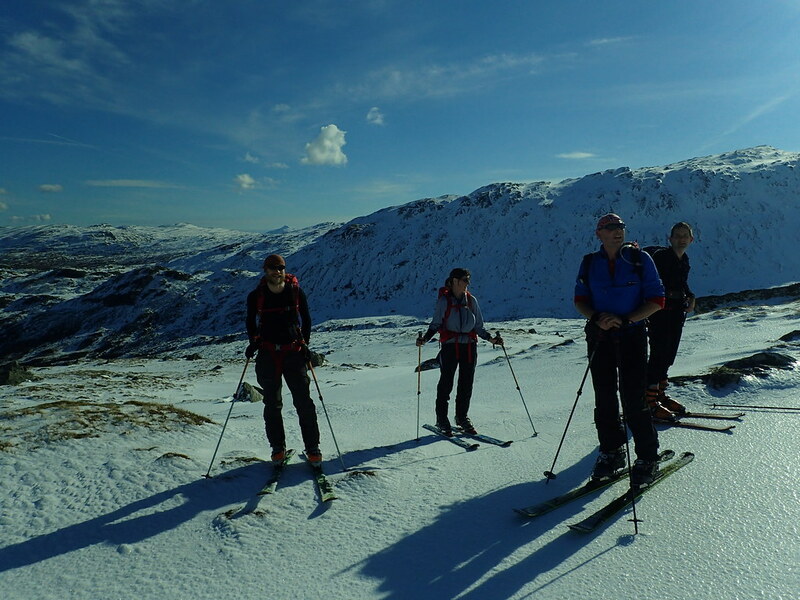 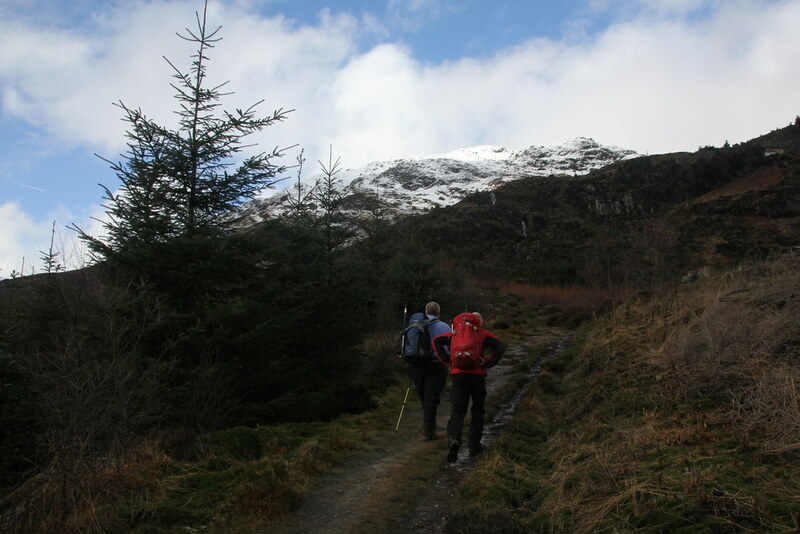 After the usual haggling between the 11 of us about where to go – we split into two groups, 4 heading off towards Ben Lawers while the rest of us sought a route befitting our level of fitness i.e. 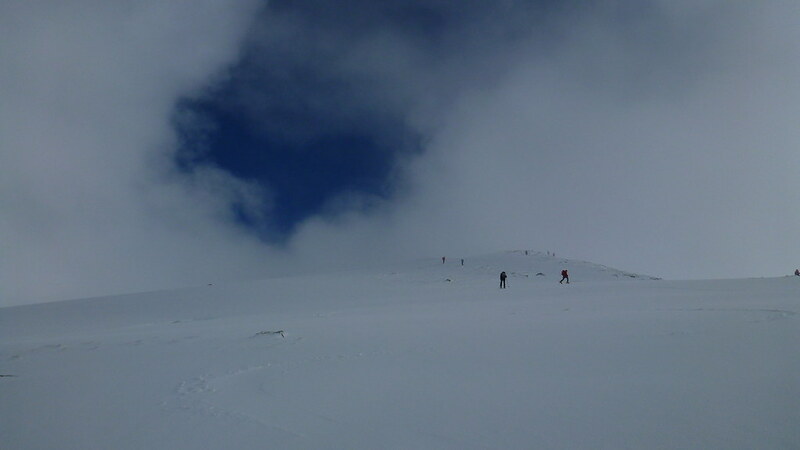 not very far. 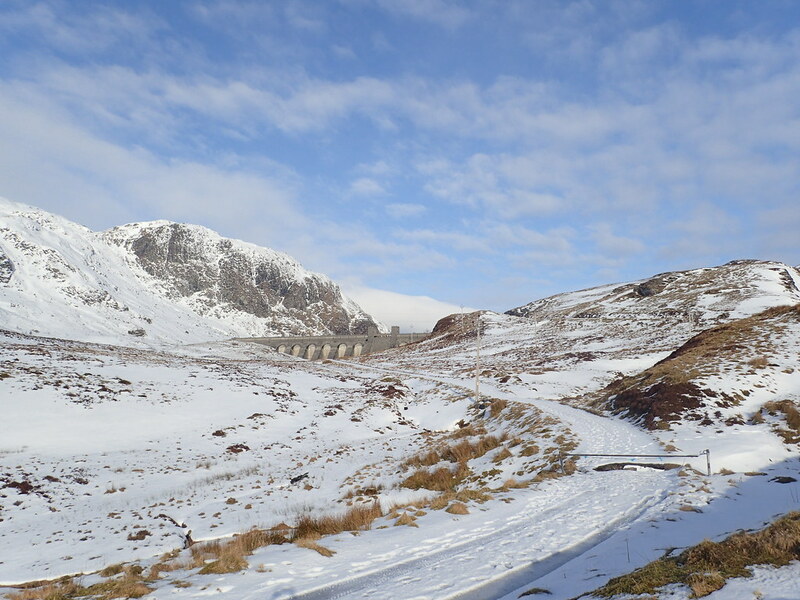 Independently ED and me came up with a route to traverse Stuchd An Lochain by leaving a car on one side at Pubil in Glen Lyon and then driving round to the dam at Loch an Diamh. 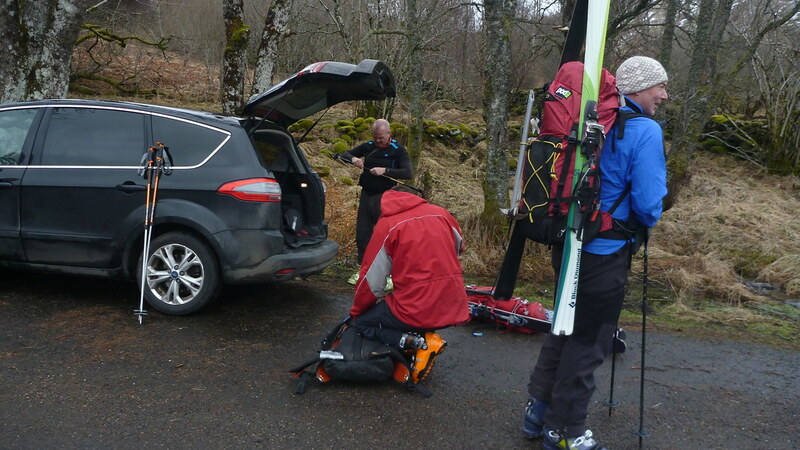 We could then start at 400 metres and walk over to the car. 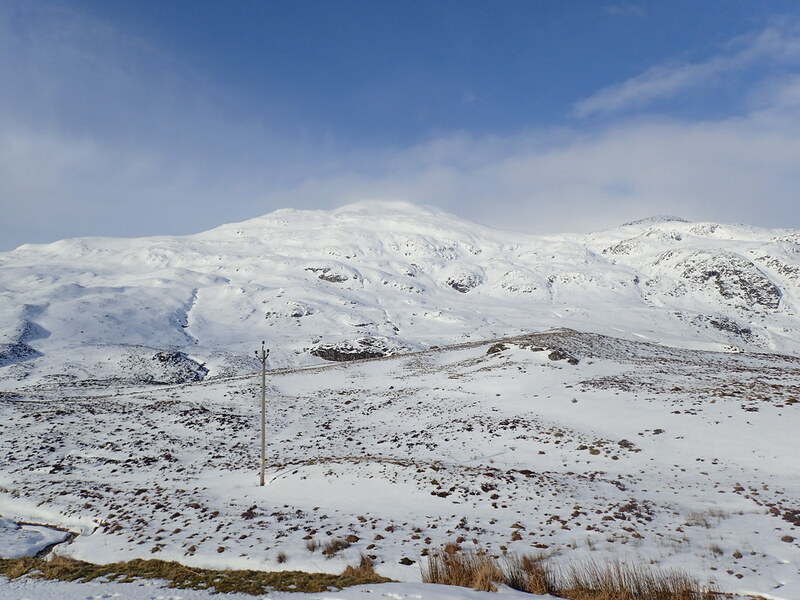 It’s an eventful drive to Pubil as the “road” from Glen Lyon is ever so slightly potholed but enjoyable nontheless unless you happen to be in the back of my car when I’m driving. 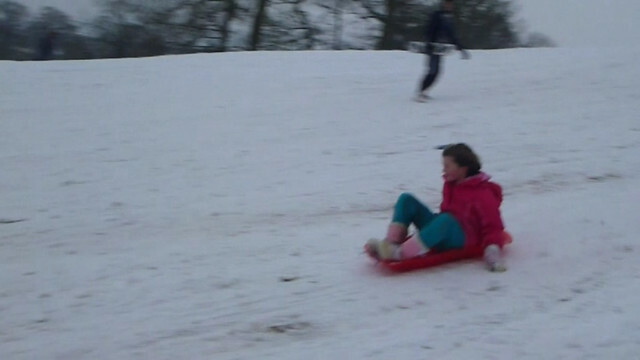 Strangely no-one fancied that option. 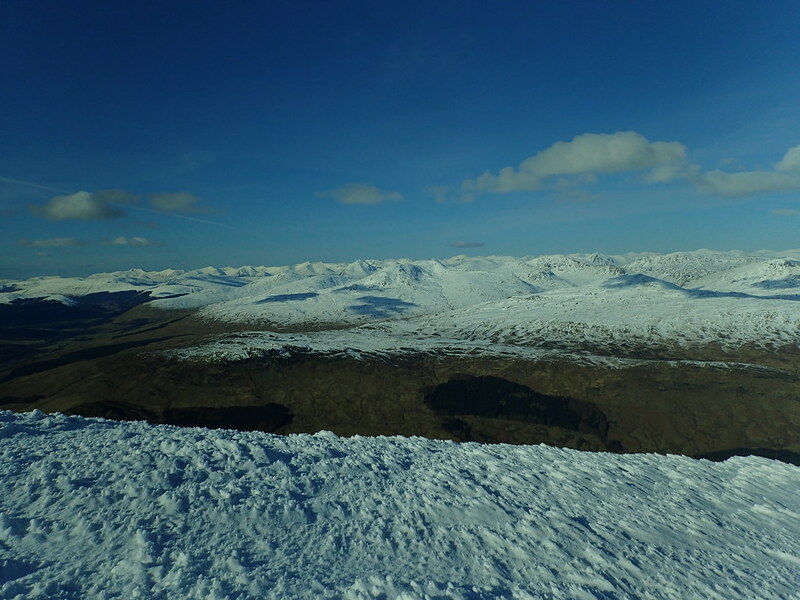 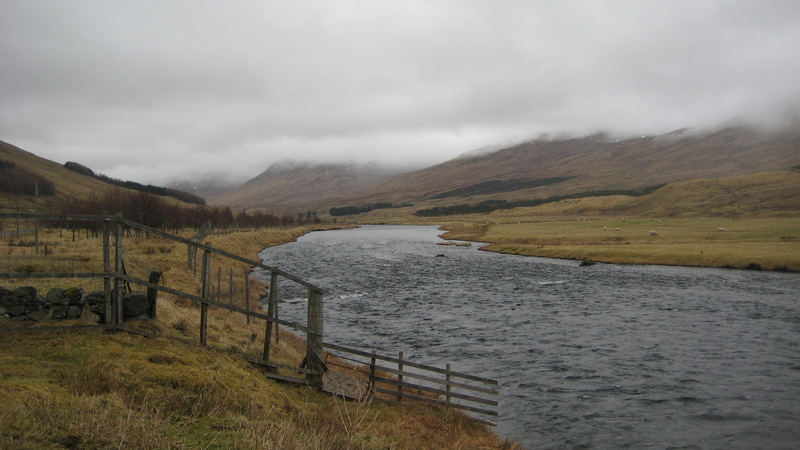 Glen Lyon is a wild spot and not somewhere I’ve been before and my eyes were drawn to the north facing corries on Meall Ghaordie – one for next year. 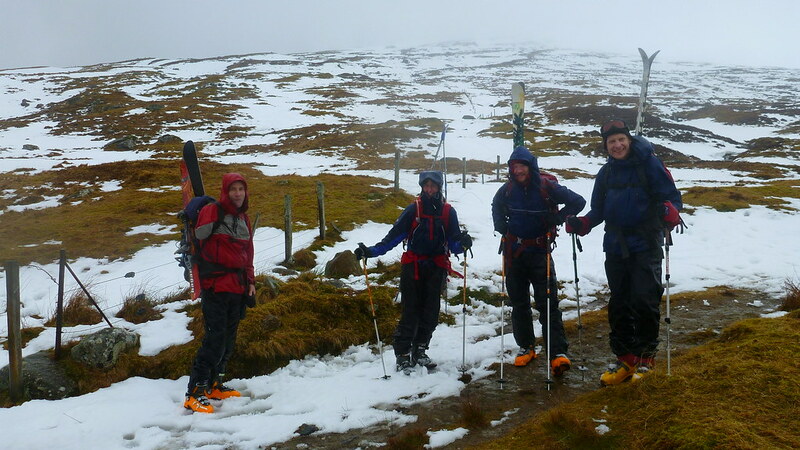 It was pretty damp and dismal when we set off but these weekends are great for catching up with the boys. 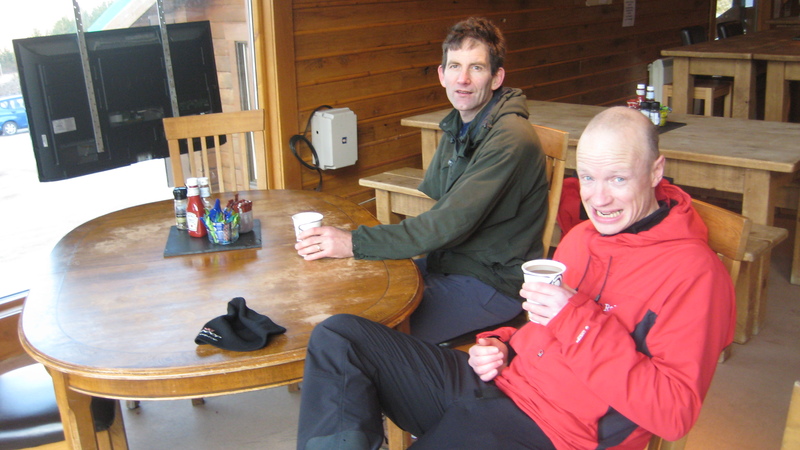 We only meet up a few times a year so it’s a great chance to catch up and tell a bunch of old stories – a bit sad but they still make us laugh and that’s the main thing. 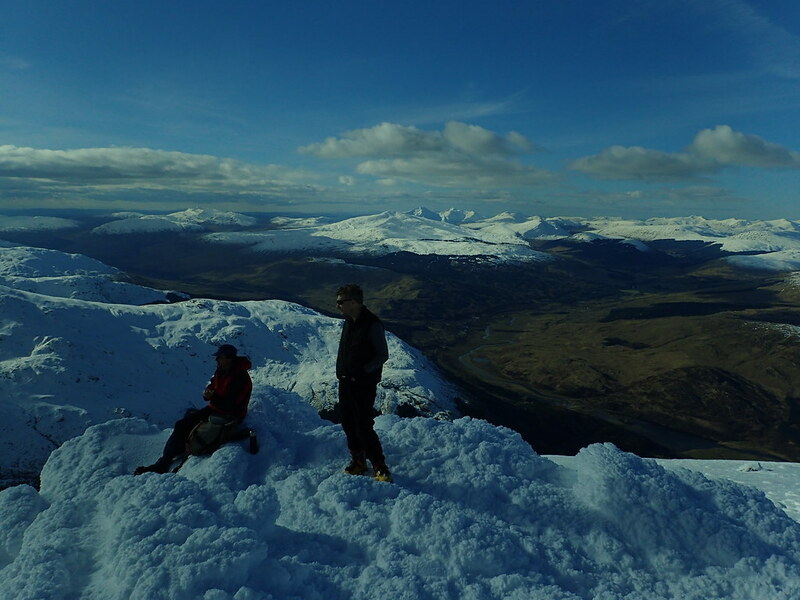 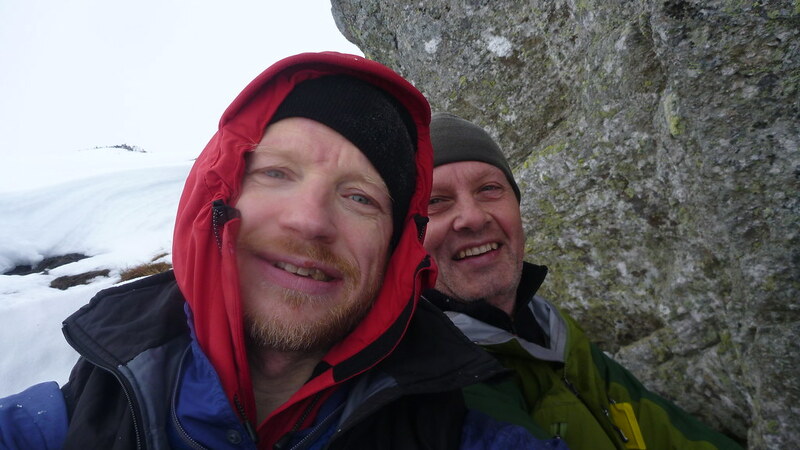 A quality baggers path led us easily up to the summit ridge for a lengthy lunch and more stories and chat. 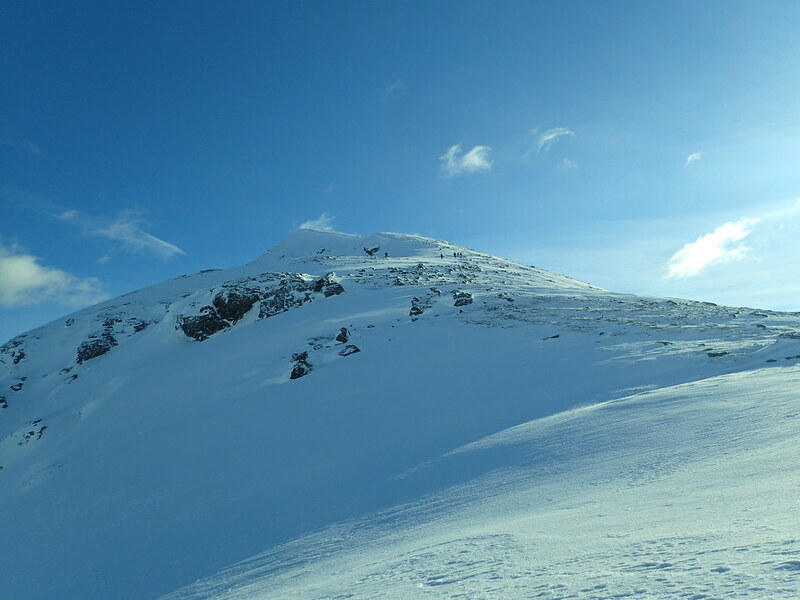 The ridge is broad and easy angled, giving just the right terrain for walking and talking, and as we progressed the cloud thinned in places giving some views north and south into the impressive corries particularly down to Lochan nan Cat. 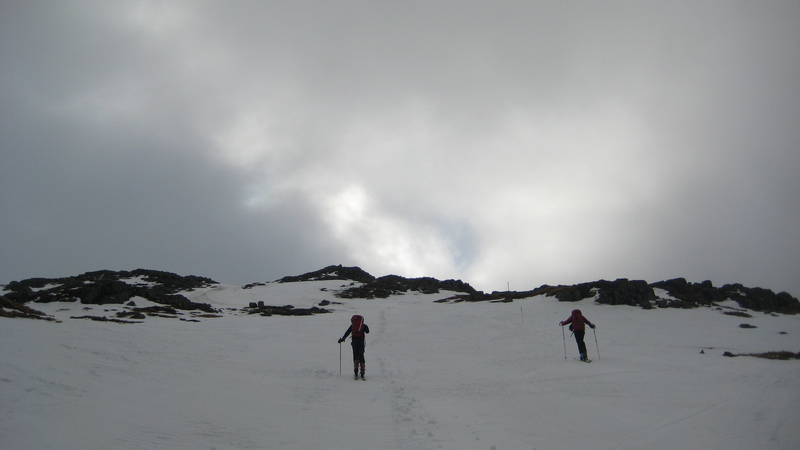 Despite the encouraging signs we never saw the sun that kept promising to show up. 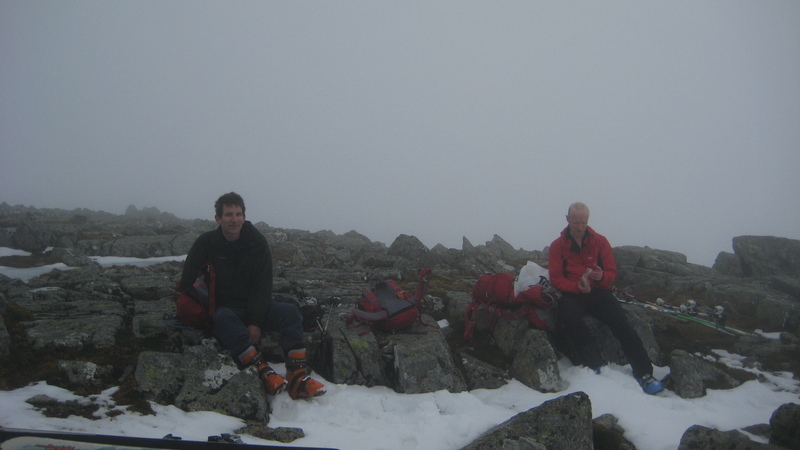 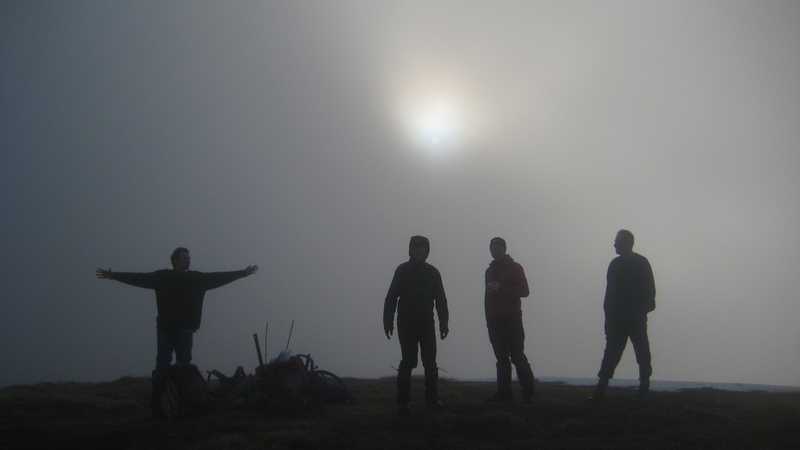 Having bagged the summit (munro 210 for me) we felt our appetite unsatisfied and the now named Eternal Weather Optimist (EWO) convinced us that his personal patch of blue sky that forever sits above his head (the deluded fool) would show itself to all of us if we climbed up the Corbett next door. 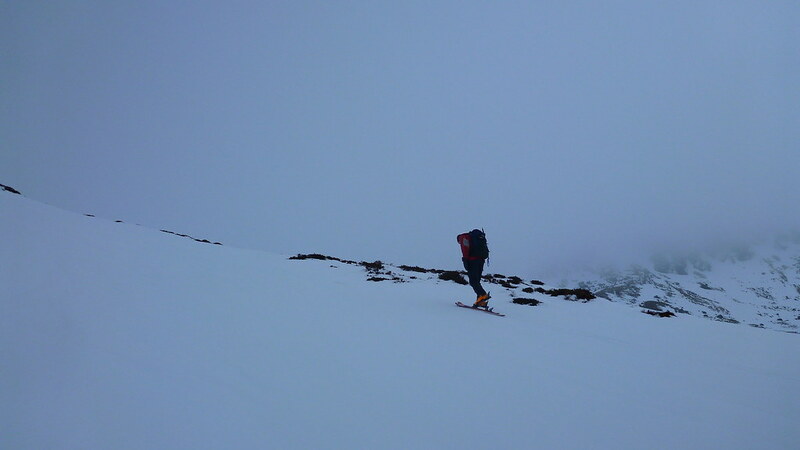 He always says this and always (and I mean ALWAYS) climbs an extra hill at the end of the day so no real surprise at his suggestion. 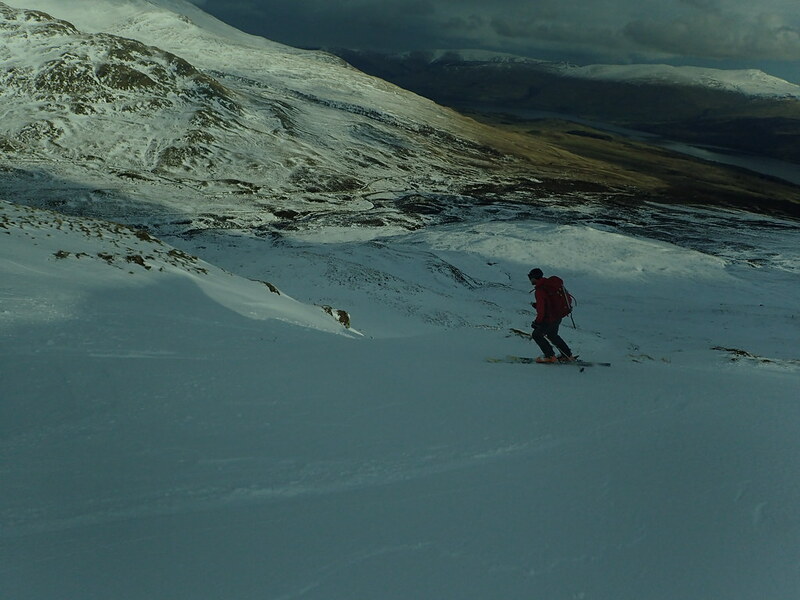 This time however he was nearly right. 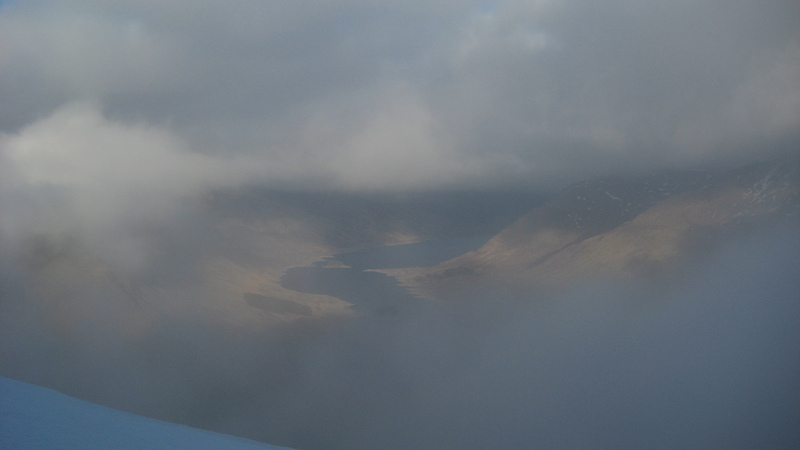 When we arrived at the summit of Sron a Choire Chnapanich the sky started to clear, there was blue sky above, the sun came out (kind of) and we were treated to some misty views back down to Loch an Diamh. 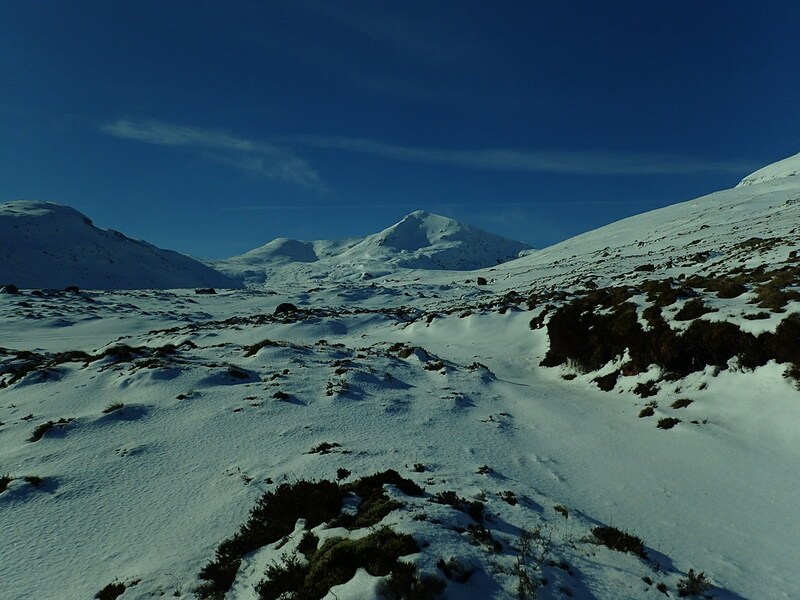 Sadly it never really cleared but in Scotland you take what you can get and we savoured the views, just long enough to get cold and decide that it wasn’t going to clear fully. 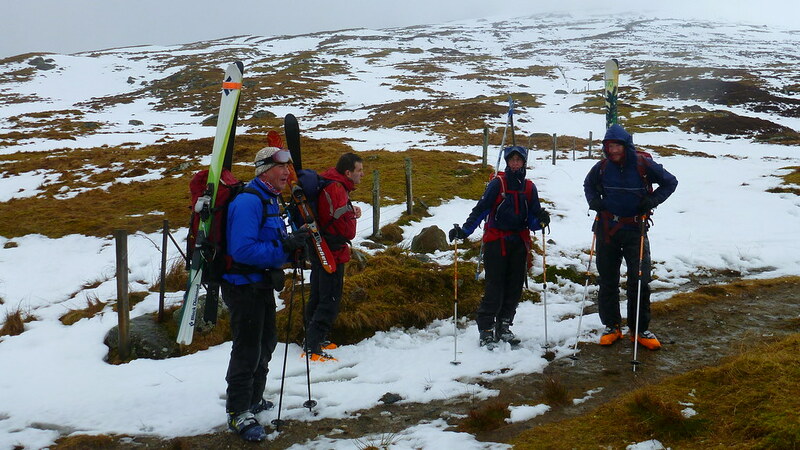 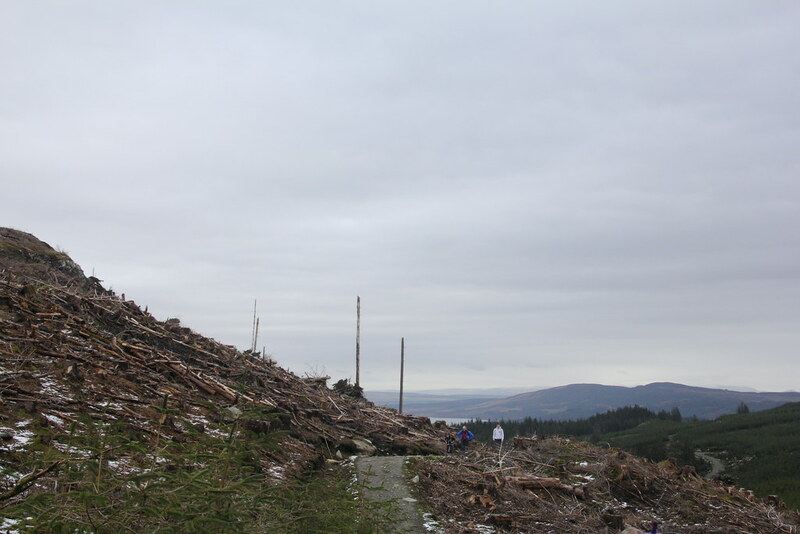 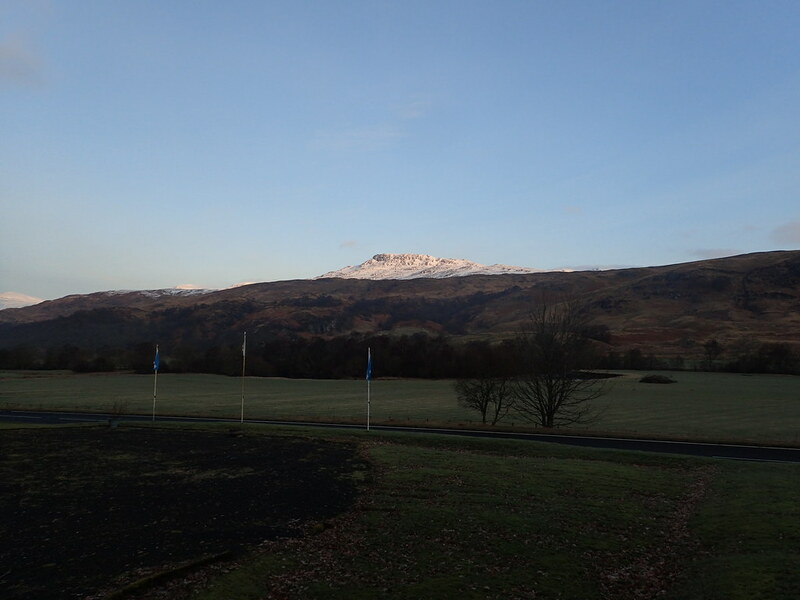 Time to head back down to Pubil over the boggy ground that can only be Scotland, play at taxis and back to Suie Lodge for more beer, food and stories – and yes, some of the same ones from earlier in the day! 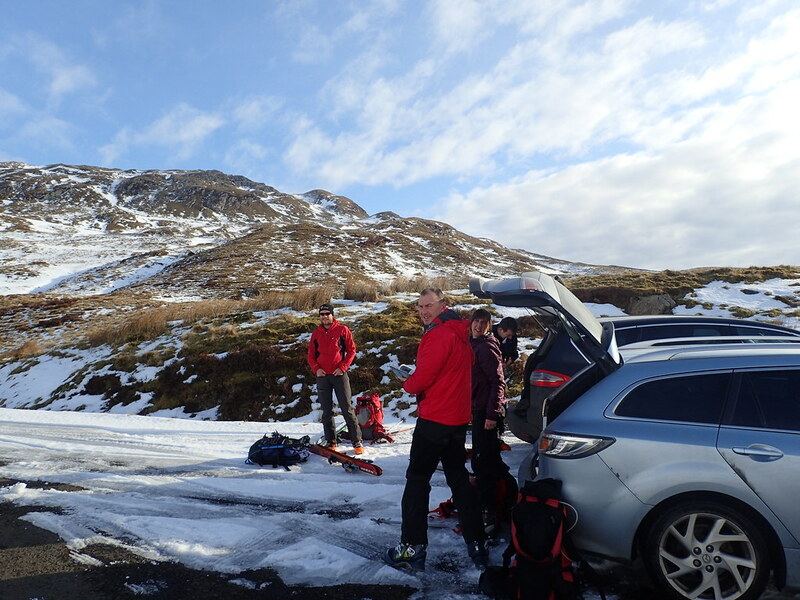 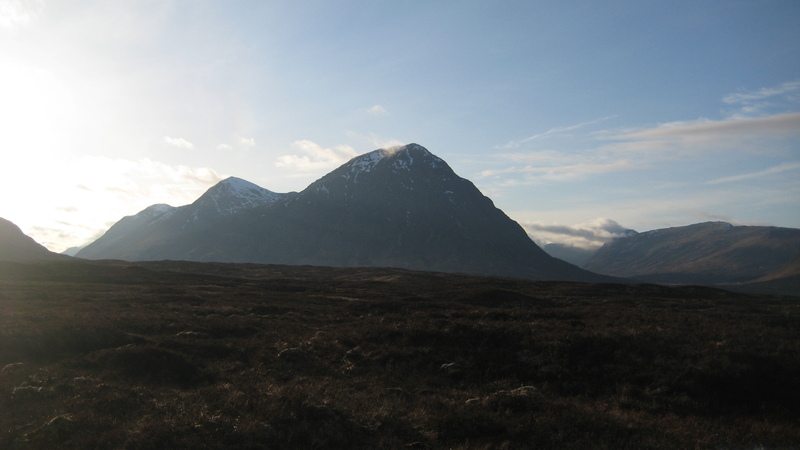 After saying goodbye to our excellent hosts at Suie Lodge, this morning’s “where shall we go” argument was between Ben Venue and Beinn Chabair. 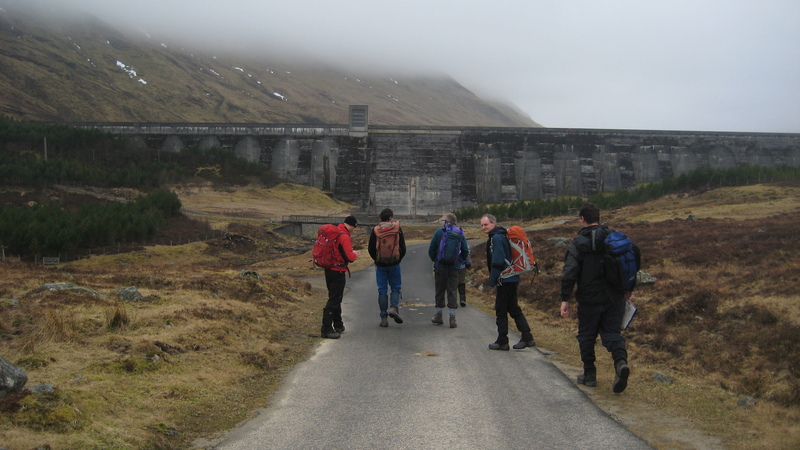 There was heated debate, factions, claims, counter claims, negotiations, arbitrations before we all gave up and fell in behind the Hard Man (HM) who seemed to have a real urge for Ben Chabair so we met up again in Inverarnan by Loch Lomond. 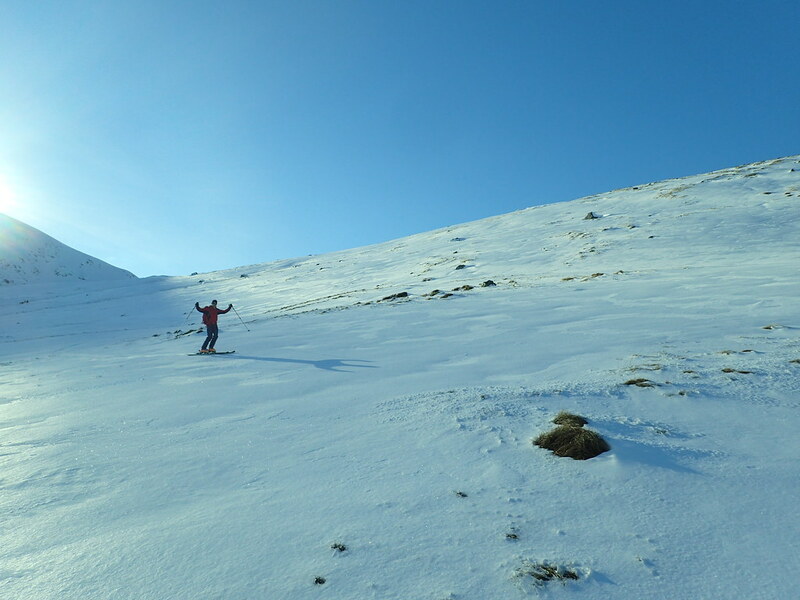 ED had already set off when we arrived and it took us a good 45 minutes of serious effort (for me anyway) to reel him in. 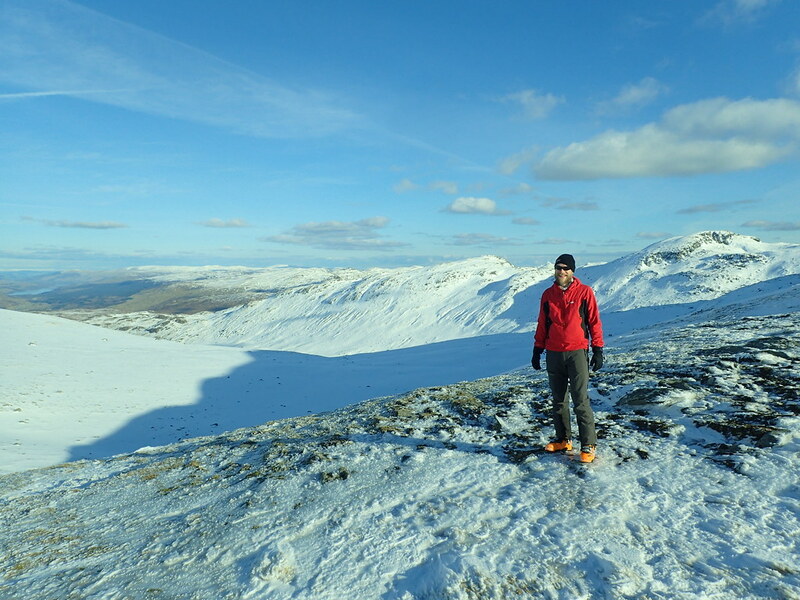 He’s suffered a bit with his health and fitness over the last few years so it’s great to see him really able to enjoy long days in the hills again. 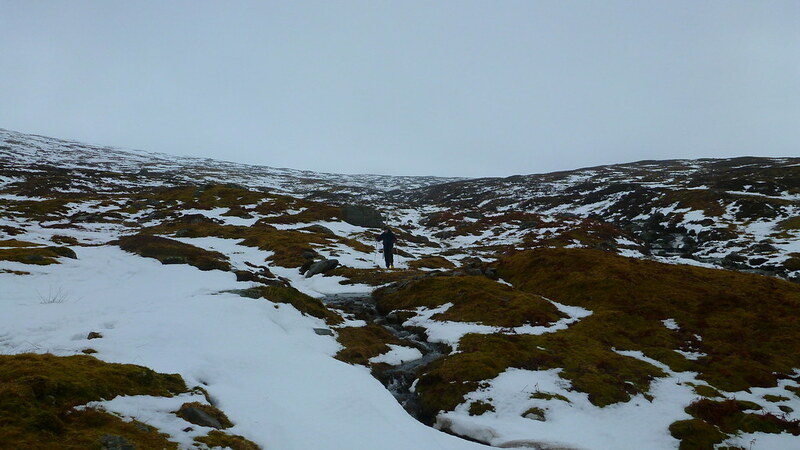 An excellent path got us easily past the really steep lower slopes to emerge on the wild and VERY boggy moorland where the path promptly vanished. 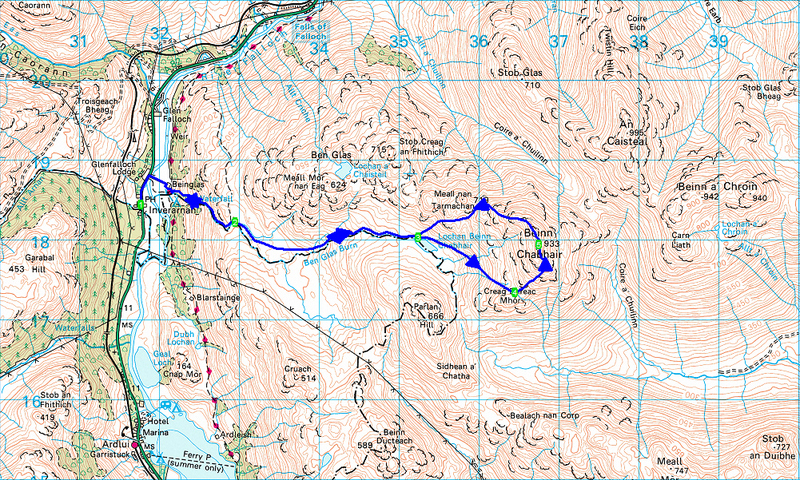 It’s a long trek up towards Ben Chabair and the heathery/boggy terrain was becoming a little tiresome but once we hit the wild corrie holding Lochan Beinn Chabair the ground improved and we could see our route above. 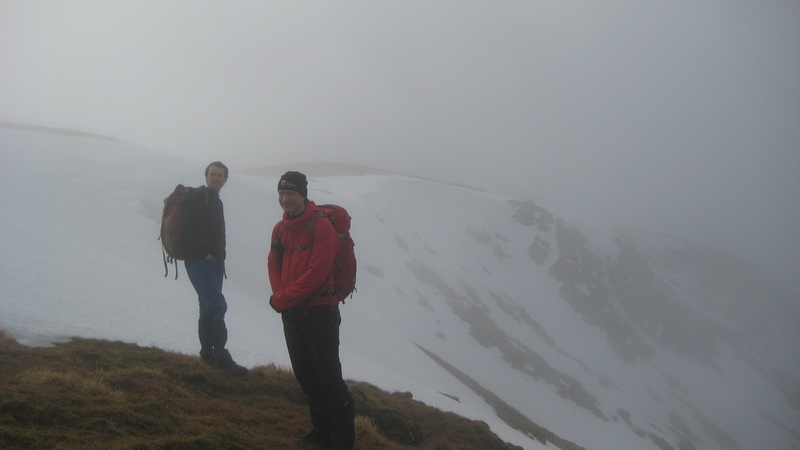 The weather was pretty dreary and grey but it would be a fabulous place when clear with the complex crags and knolls of the west ridge of Beinn Chabair looming high above. 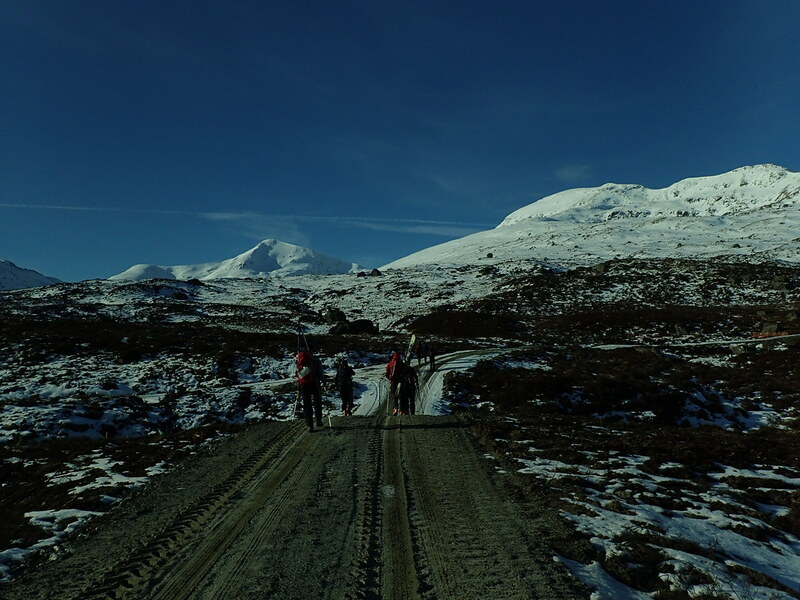 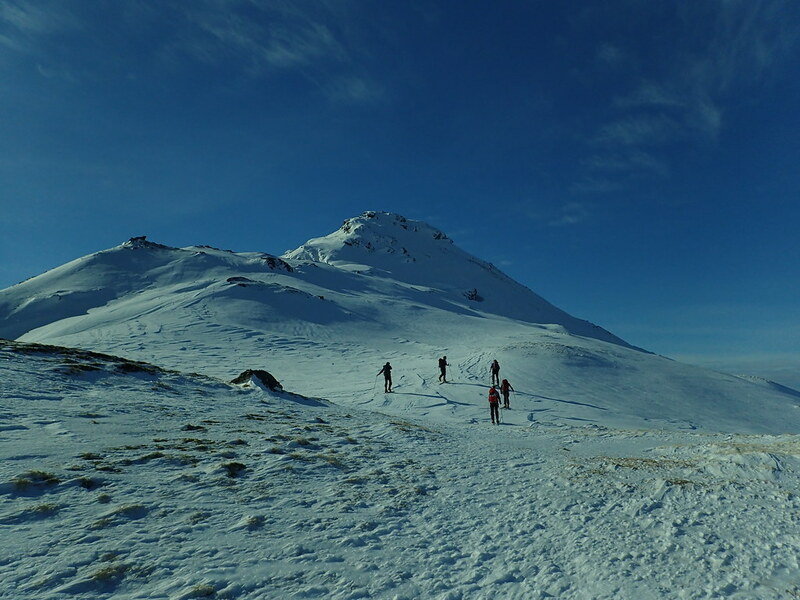 As we climbed higher everything became coated in ice and frost but unlike the day before there was no sign of the cloud clearing. 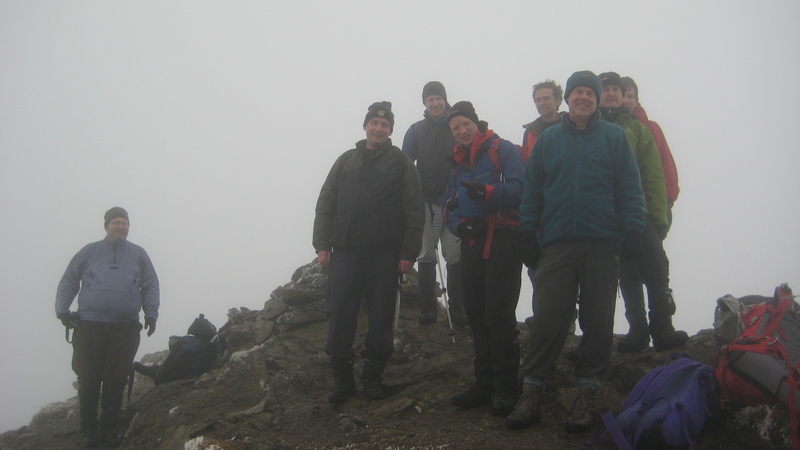 We ascended the south ridge and all reached the summit (munro 211 for me) for the obligatory team photo. 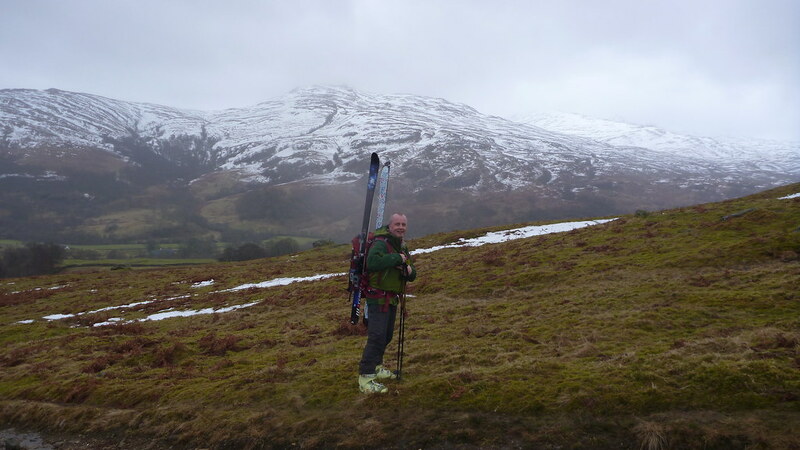 ED compares us to the Bash Street Kids in his blog. 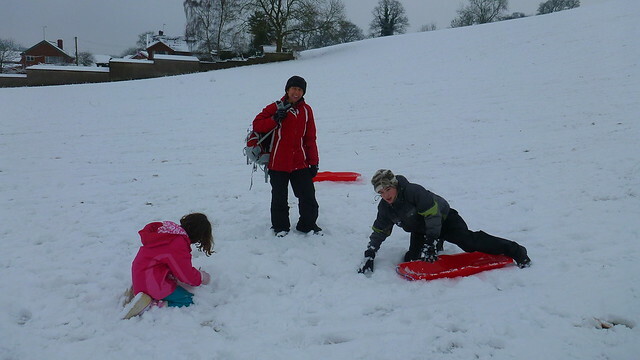 All I can say is we’re an excellent testimonial for Care in the Community. 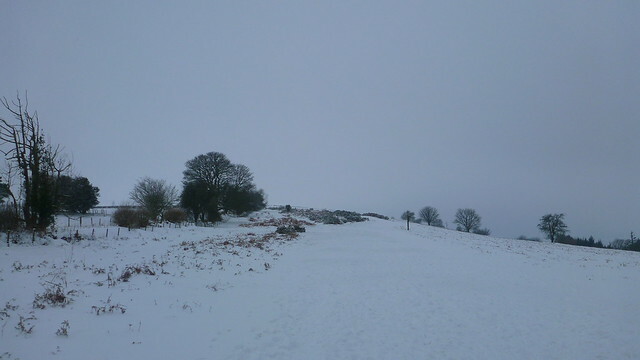 The route down twists and turns through the aforementioned west ridge knolls. 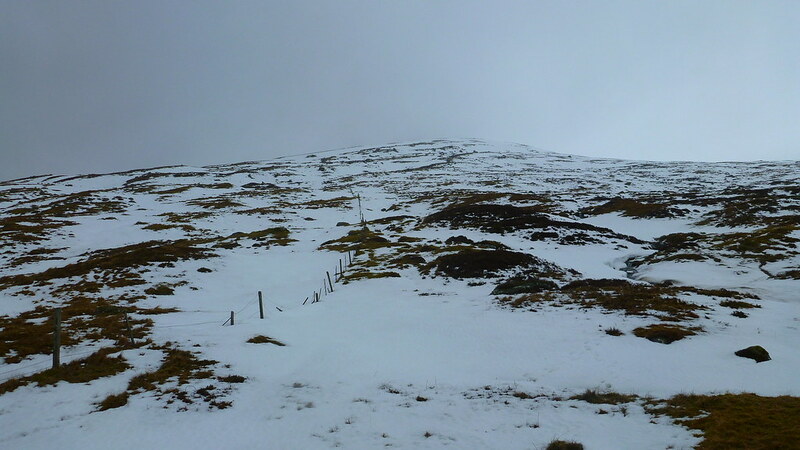 On a better day it would be interesting to take this ridge all the way down and explore the many crags and hollows. 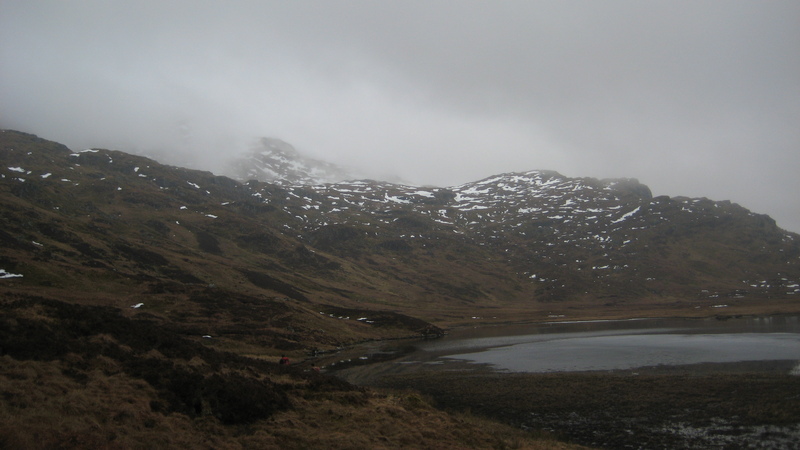 On a dreary Sunday with legs wilting after a couple of decent days and long drive home we simply retraced our steps back to the end of Lochan Beinn Chabair and back down to the cars. 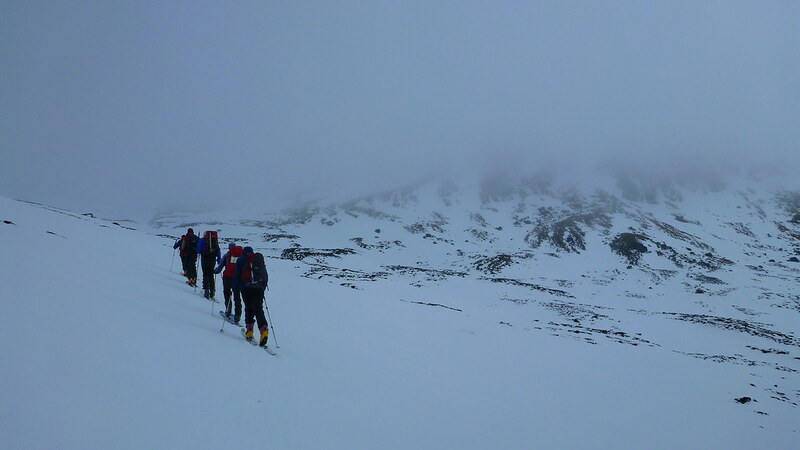 The “Jolly Boys Outing” over for another year – roll on 2012!